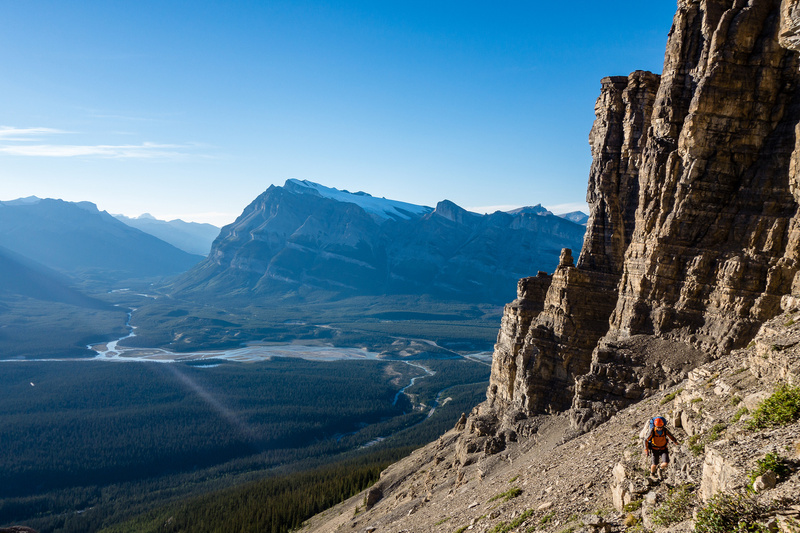 Difficulty Notes: Steep loose terrain with many small cliffs and lots of exposure. 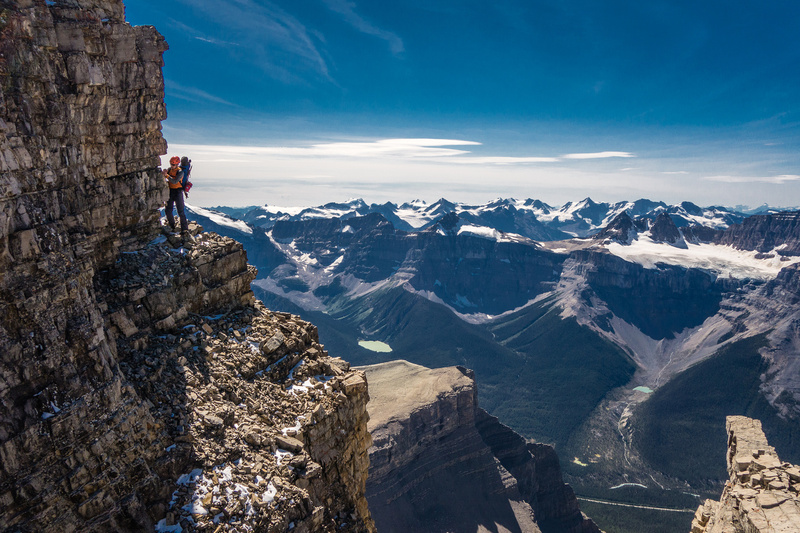 Do not under estimate the size of this mountain, or its looseness and exposure to the summit. 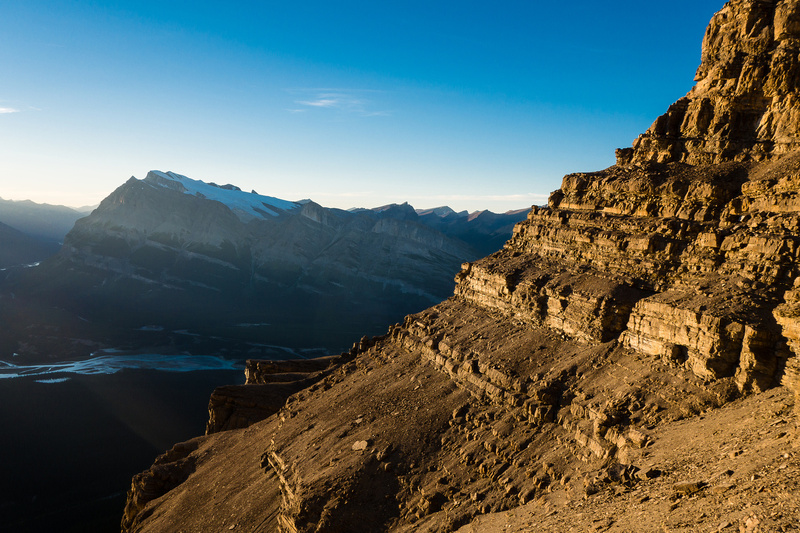 Mount Murchison has been tempting Raf and I ever since we first got a really good look at her summit from across highway 93 while sipping Starbucks on Mount Sarbach in 2009. 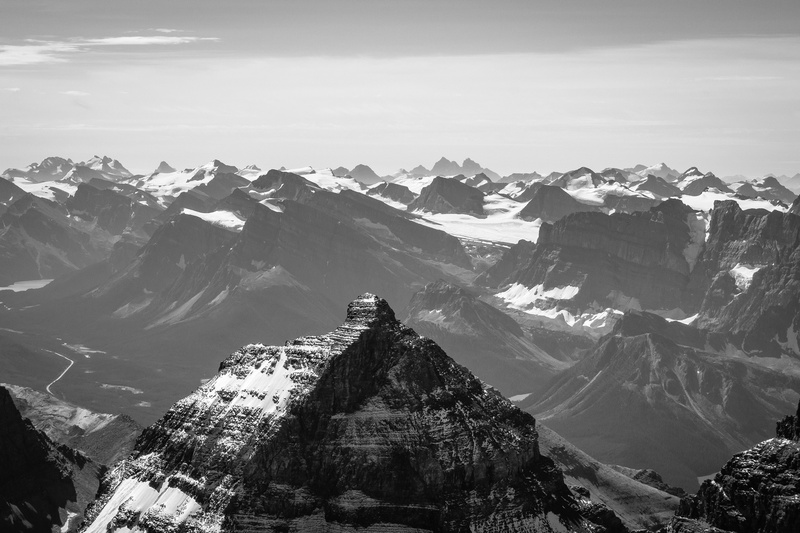 Already in 2008 my appetite for this mountain was wet by Andrew Nugara’s trip report of him and his brother’s ascent. Murchison is a huge massif, covering a main mountain with two summits plus 7 other towers which are adjacent to the two main summits. Something else that is fascinating about Murchison is that it’s listed height (3333m) is actually not the true height of her highest (SE) summit. 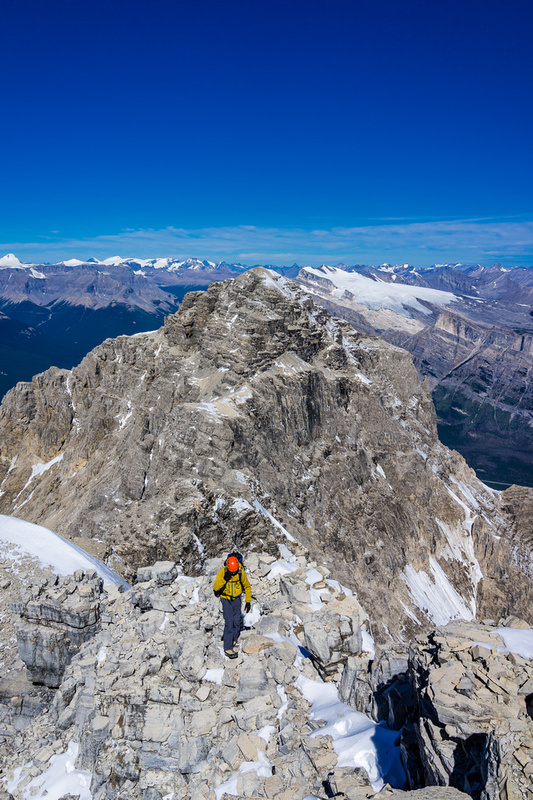 The first ascent party didn’t summit the highest point and the first officially recorded summit of the highest point on Murchison wasn’t until Rick Collier did it in 1996 and built the first cairn / register on this remarkably accessible peak. 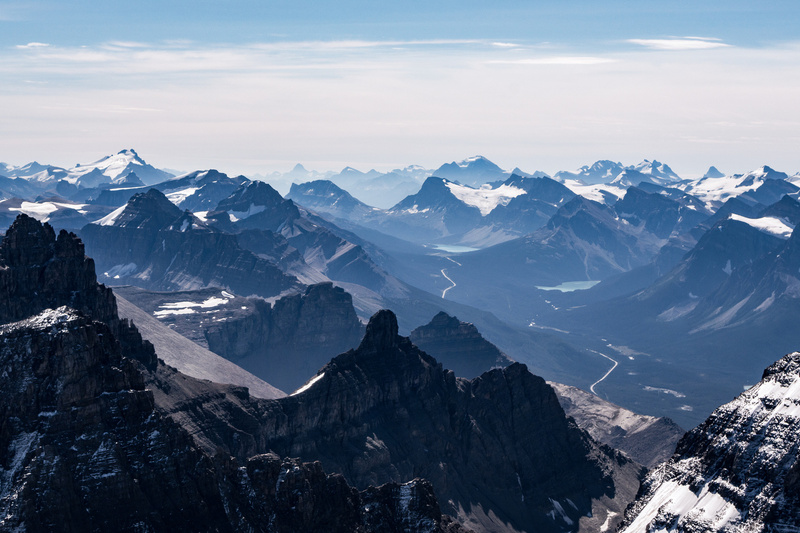 Collier tentatively claimed the FA but later learned that John Martin had summitted previously but left no cairn so Collier’s group was probably the 2nd summit party. This trip was very last minute – just like our Sarbach trip. Raf texted me on Wednesday around noon and asked if I could make room for a Murchison trip starting that afternoon! Obviously I somehow made it happen and by 17:30 we were departing from the parking area (Mistaya Canyon / Sarbach) along highway #93 and crunching up the approach gully, a rocky stream bed located a few hundred feet north of the parking lot. We decided to make our summit day much less stressful by bivying high on Murchison’s SW shoulder. 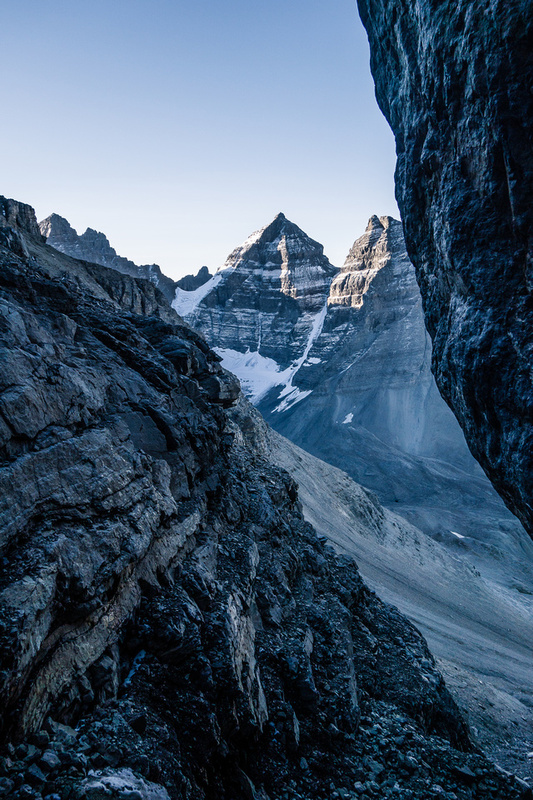 We knew we were pushing our luck since it took Collier’s party 6.5 hours to reach the bivy and we only had 4 hours of daylight but we figured we could do it in about 3.5 hours – the Nugara’s time, although they didn’t have bivy gear. 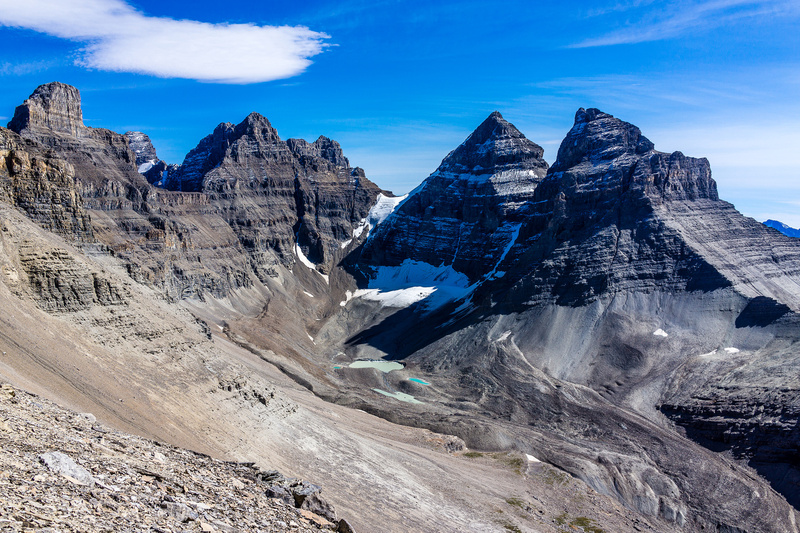 Raf pointed out that I was probably the first person to bag 3 of the 4 Saskatchewan Crossing peaks in the same year (Survey, Wilson, Murchison) and probably one of the only people ever to bag all four (Sarbach). I replied that this fact didn’t make me feel any better about my sanity. I was tired but feeling surprisingly good considering my lengthy Recondite Peak trip only 4 days earlier. 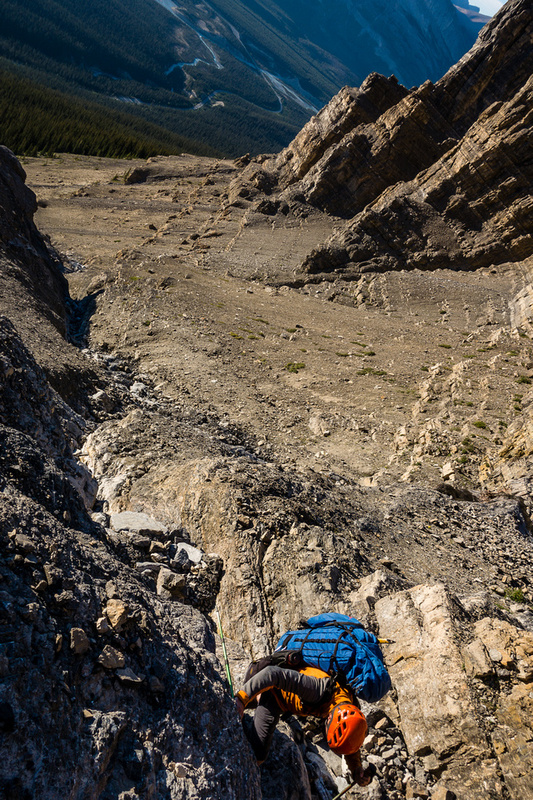 My pack wasn’t exactly light, containing bivy and basic climbing gear. We noticed fresh snow high on the north face of the mountain from the parking lot, so we packed our axes and crampons. We also brought a 30 meter rope, some slings and basic rock pro just in case some of the scrambling terrain became more than that. Our idea was to use very limited beta we had from the Nugara trip report which hinted at avoided climbing (i.e. roped) terrain by heading straight for the NW / SE summit col rather than first ascending the NW (false) summit and then descending from there to the col. It’s along this descent that a rap is required. From the col to the SE summit the terrain was supposed to be difficult scrambling to some low-5th class terrain just before the summit. We started off in the dry creek bed but soon found ourselves on climber’s left (N) on steeply forested slopes. This was much easier than trying to duck under dead fall in the creek and stumble over fresh debris from the flash floods earlier in the year. Raf was immediately concerned about water sources since the creek looked very dry. I assured him that we’d be fine but in the back of my mind I was a bit concerned because both Raf and I weren’t carrying nearly enough liquid to last 1.5 days! Water weighs a lot and I try to drink as much as possible directly from streams along the way to save my back / knees more punishment than they need. Turning back due to lack of water hasn’t happened to me yet, but there’s always a first time. Ascending the treed NW slopes worked very well and we gained height beside the stream quickly and efficiently. We passed two waterfalls (pretty much dried up) on the way to tree line. Near tree line we deviated from Collier’s report and crossed the stream, accessing the amphitheater on climber’s right of the stream, rather than directly above our ascent line. 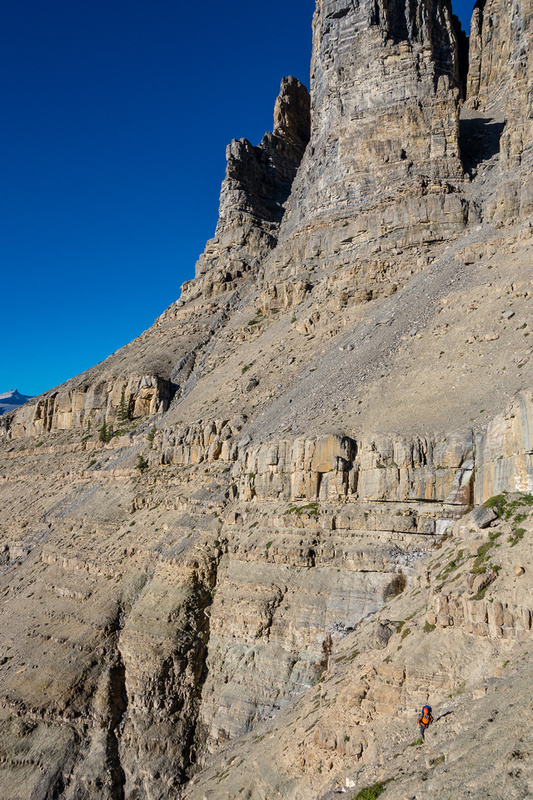 This wasn’t necessary – we should have continued up in a direct line and worked left into the amphitheater from under the cliffs above. Oh well. 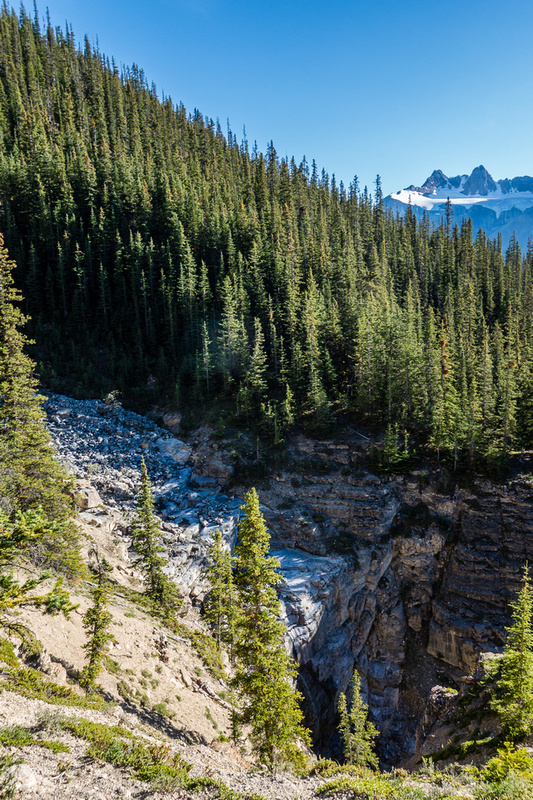 Mount Murchison looms over our approach along the N side of the creek. The amphitheater looks rather insignificant from here. 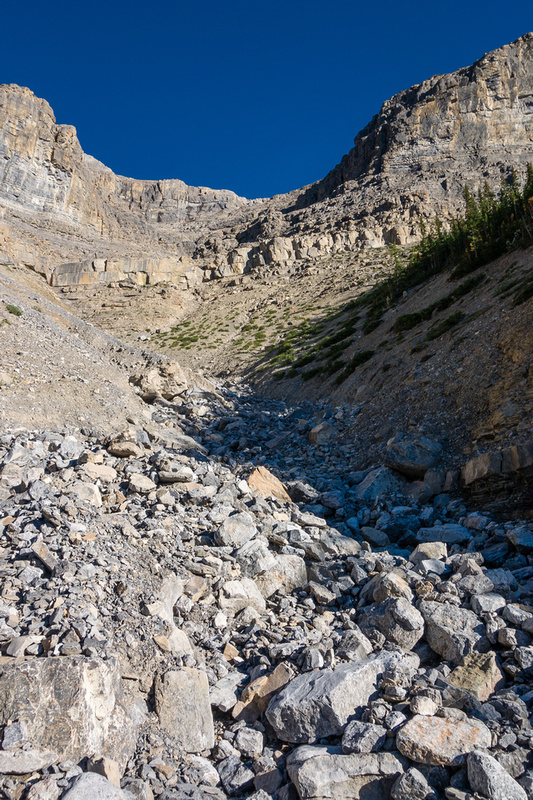 Looking up the rocky drainage approaching the more complex terrain in the NW bowl. As you can see, the terrain in the amphitheater is huge. It’s also extremely loose! 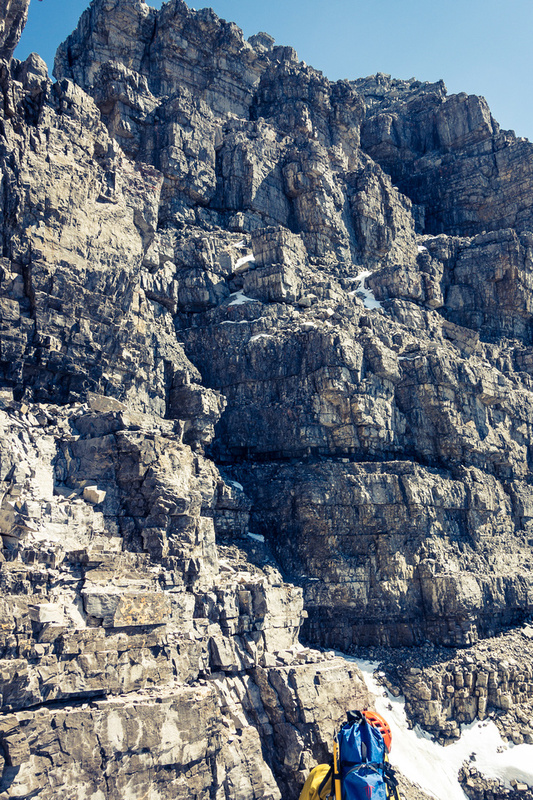 I wouldn’t go up this mountain with more than 2-3 experienced people due to rock fall hazards. 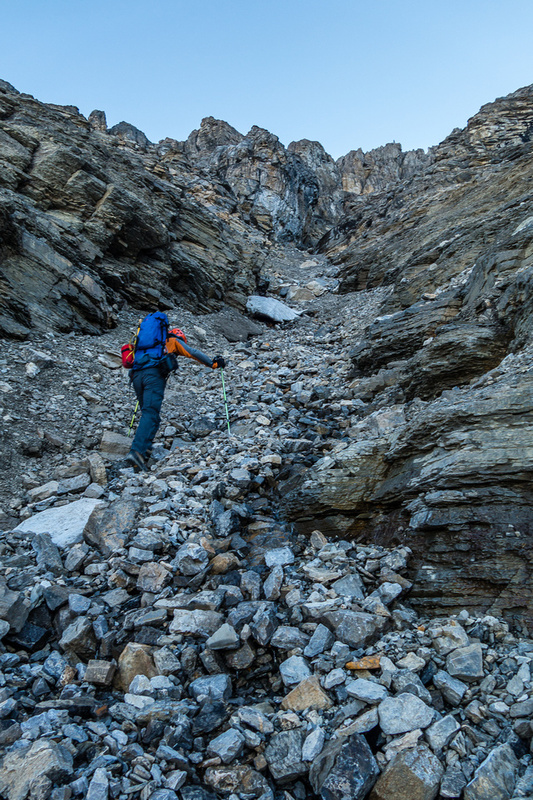 We picked our way back and forth across the main NW gully (some running water here, thank goodness), always choosing the path of least resistance. 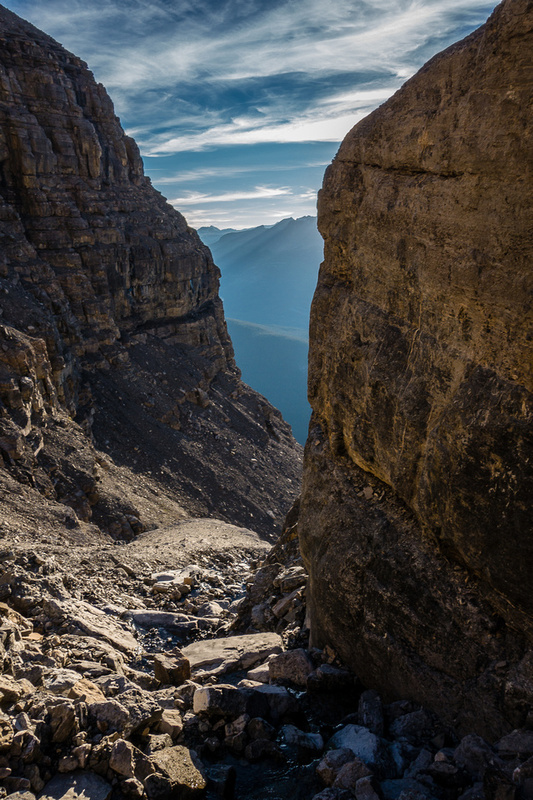 There were some traverses along cliffs that I wasn’t sure would work out but we always managed to find a way. I guess after hundreds and hundreds of peaks between the two of us, Raf and I are becoming like goats in some respects. “Young” goats perhaps? 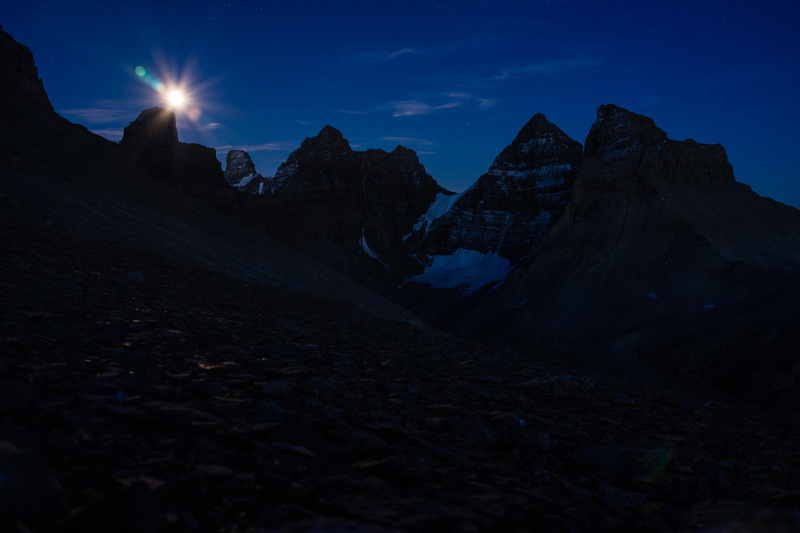 I am proud of the route finding we did – moving quickly and efficiently was the only way we could possibly beat darkness to our bivy site. Looking back down an interesting twist in the bowl. 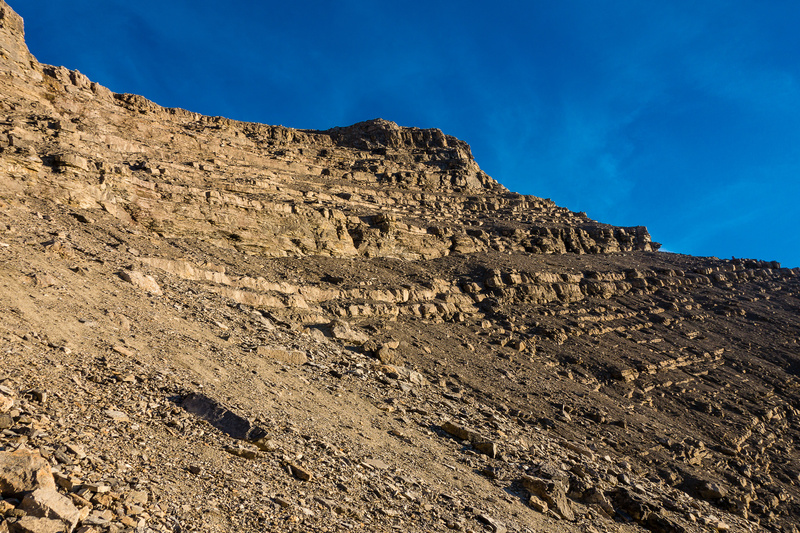 More complex terrain above us as the sun begins to set. The terrain was mostly moderate scrambling but there were difficult parts too – we both expressed concern with down climbing some of them. At first we thought the huge amphitheater was like the one on Amery but soon we realized this one was slightly harder to navigate and much looser rock. 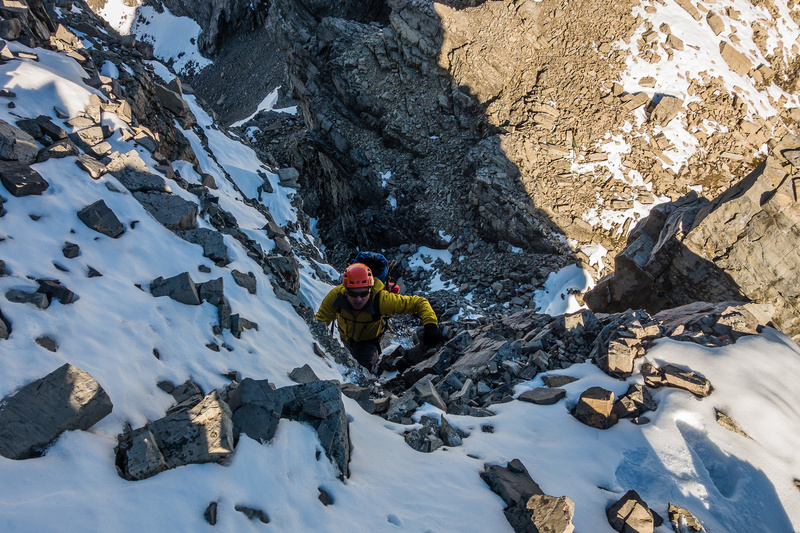 In general we crossed the main NW gully three or four times on ascent before accessing the final staircase on climber’s left (north) under the towering cliffs coming off the NW summit. 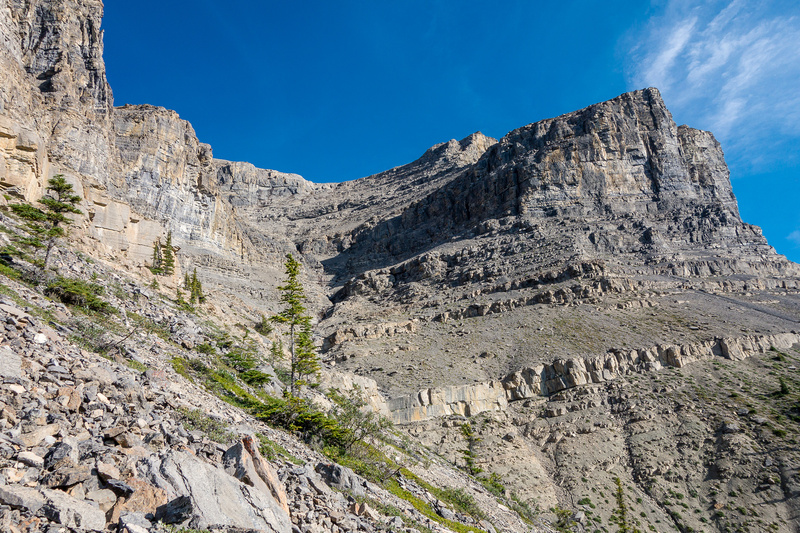 We worked our way along the walls up to climber’s right until spotting a way through the upper cliff bands and onto annoying scree to the upper west shoulder and bivy location. There were no obvious signs of previous parties anywhere on approach except for the odd footprint that could have been human or animal. I also thought I spied trekking pole marks (holes) but couldn’t be sure – the odds seemed very low that we were following anyone up this rarely ascended mountain. 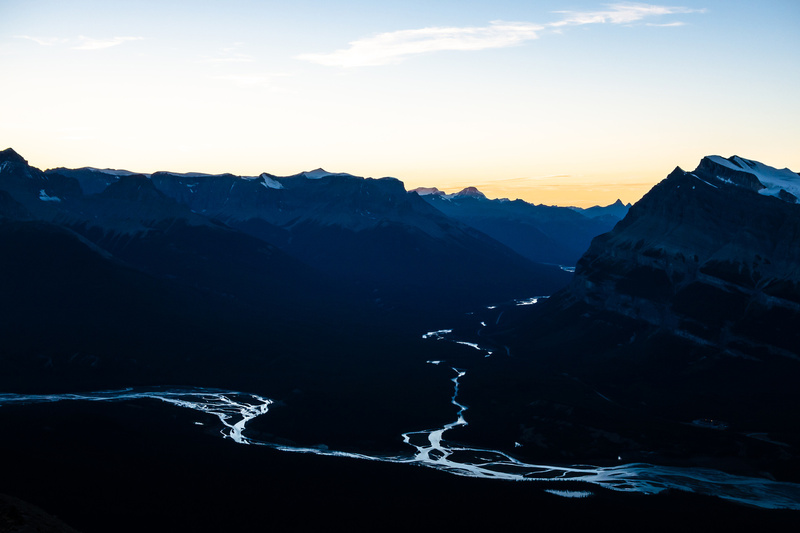 Sunset over the Saskatchewan River Crossing from near our bivy site. The moon rises over the Murchison Towers. From L to R, Southeast, Hall, Cromwell, Engelhard, Gest and Feuz Tower. Darkness was setting in very quickly as we both expressed amazement at the great views of Wilson, Lyells, Forbes, Sarbach, Kaufmann, Epaulette, White Pyramid, Chephren and the Murchison towers from our bivy. We were surprised to discover we were already at 9,000 feet. I think we both got too optimistic at this point, thinking that the next day would be very short / easy with only 2,000 feet of height to gain. We both expressed the thought that Murchison might be better as a day trip but we loved the bivy location anyway and it couldn’t hurt to have more time on route the following day. We made the bivy in 3.5 hours from the parking lot but that was moving through steep, loose and difficult terrain very quickly. 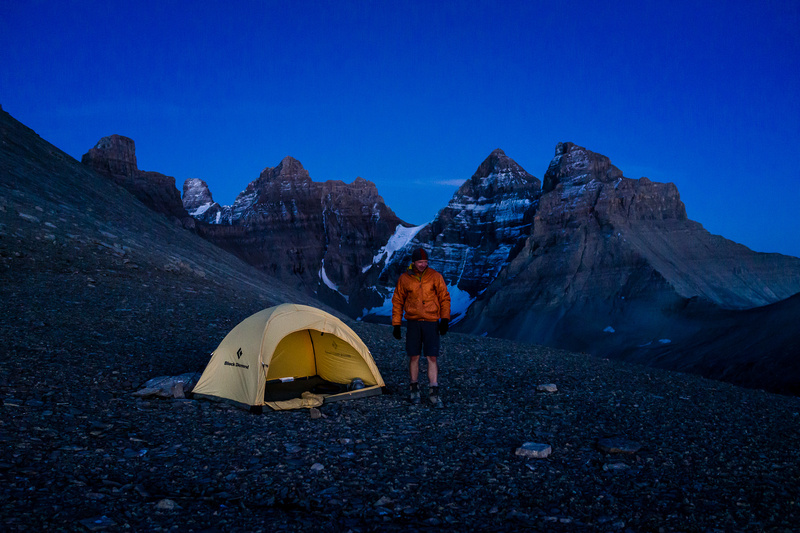 I think 4-5 hours is not unreasonable with bivy gear. The wind was cool and steady way up on the shoulder so after taking some shots of the incredibly bright moon (no stars due to its shine) we turned in for the night. The wind was cool and steady over night and I was jealous of Raf’s tent – I hate zipping up bivy sacks over my face as I’m slightly claustrophobic. Starting off in the rocky drainage near hwy 93. Following the north side of the drainage. As you can see, the terrain in the amphitheater is huge. It's also extremely loose! Looking back at Raf as we cross the drainage to our right - our ascent slope visible below along the lower drainage. The terrain was very interesting and fun to work through with ledges and waterfalls and lots of no-slip zones. 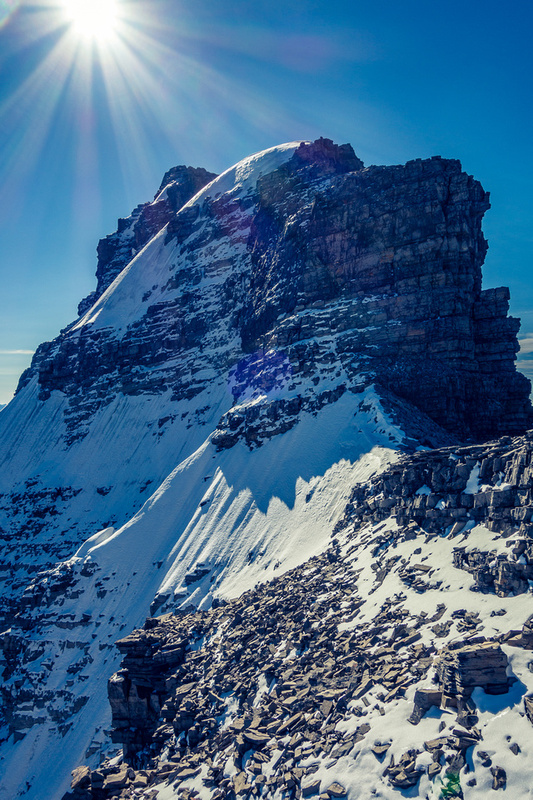 Everything on this mountain moves if you pull hard enough.The problem is that you have to pull on something in order to climb. Raf works his way up the narrowing gully. 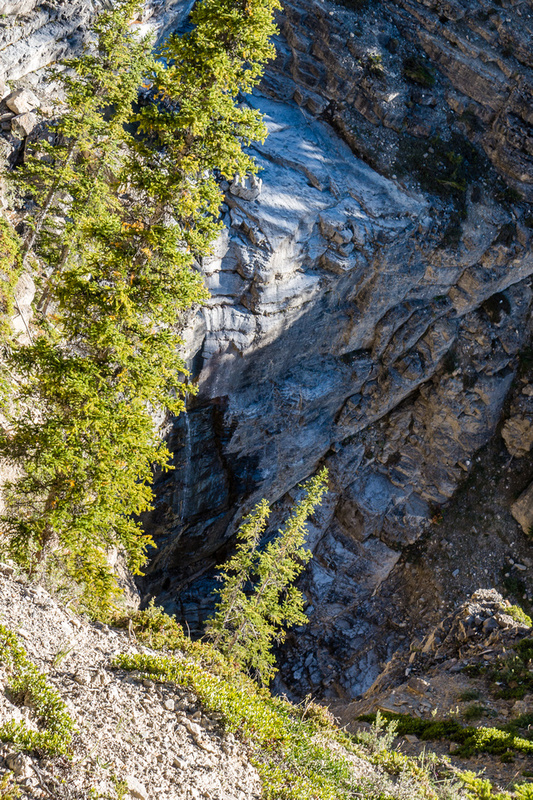 Looking up the gully - it's so much fun to route find up new terrain. A great shot of the evening sun as we work our way higher and higher into the amphitheater. The upper part of the amphitheater. You may be tempted to head for the ridge on climber's right but don't bother. Setting sun in the NW bowl with Mount Wilson across Hwy 11 at left. 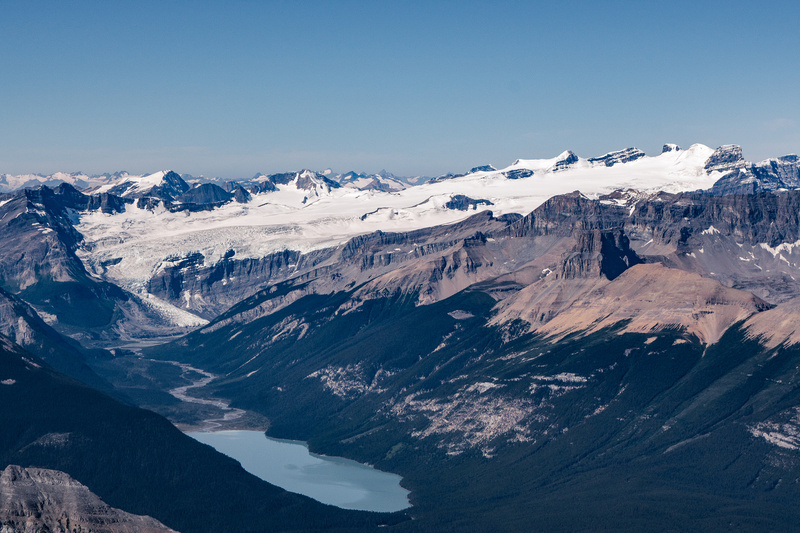 Glacier Lake and the Lyell Icefield. Looking over the Saskatchewan Crossing far below, and the meeting of the Howse (L), Alexandra (C) and North Saskatchewan (R) Rivers. Nice sunset looking up Hwy 11 and the Alexandra River. Raf gathers rocks to ensure his tent doesn't blow away. The west shoulder is fully exposed to the elements. 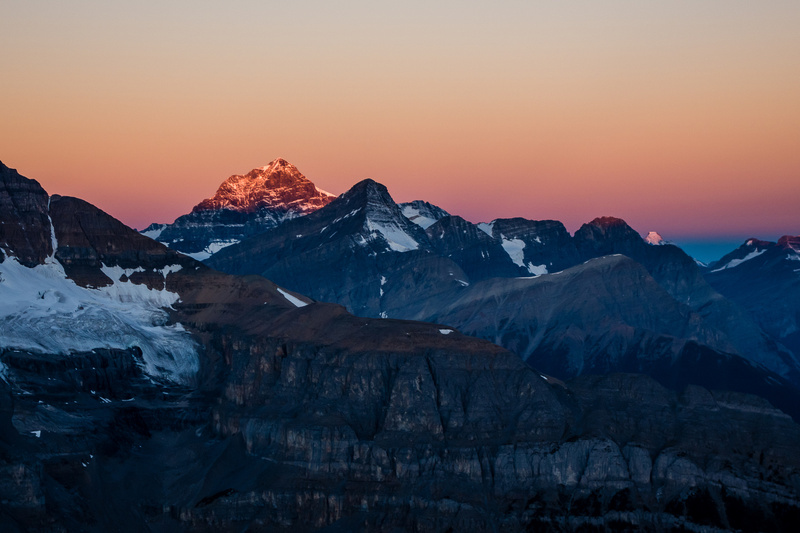 The morning sky was clear so we dragged ourselves up at around 06:30 – there was no point in trying to negotiate difficult terrain in the dark. 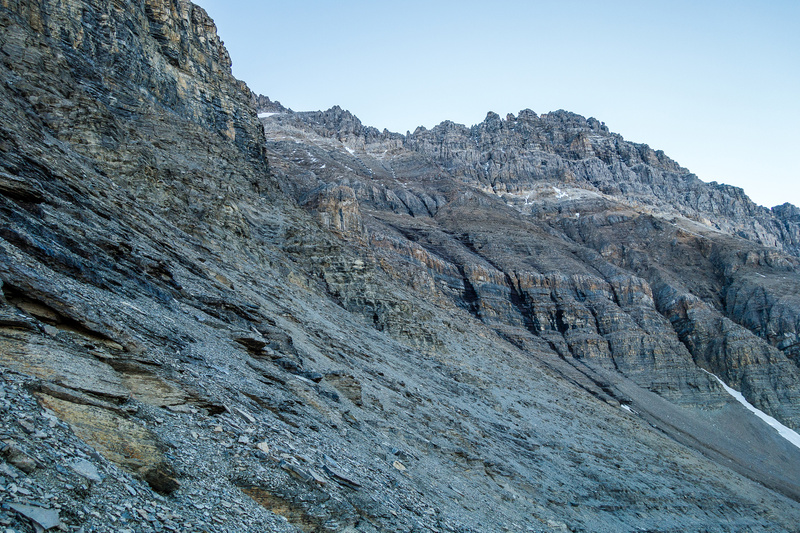 After taking some nice sunrise photos and packing for the day we headed off, aiming for a point slightly above us and around the SW scree slopes – hoping to find the obvious snow gully that led initial ascent parties to the NW summit. Without gaining too much height we did find the ascent gully. There was some super-hard sn’ice in some places but it was mostly dry at the bottom. 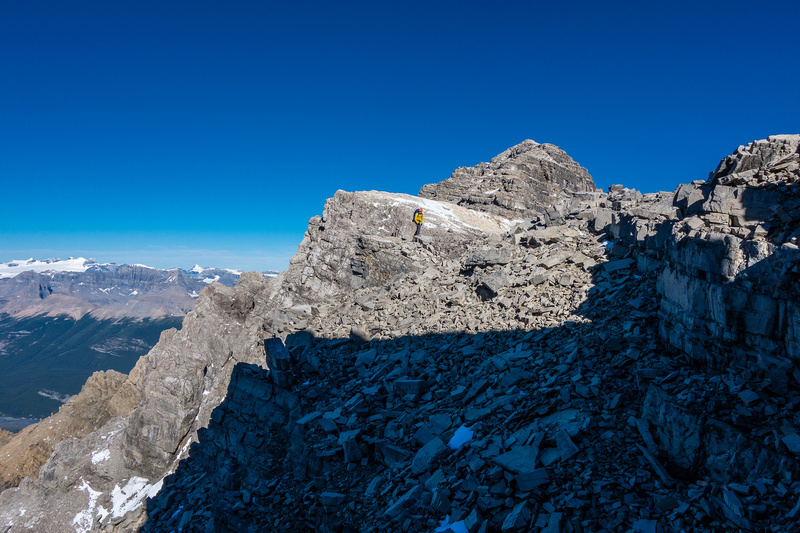 I had GPS way points roughly plotted to guide us out of the gully and to the NW/SE summit col to avoid unnecessary height gain and the rappel into the col off the NW summit ridge (we were hoping to avoid rope use if possible). 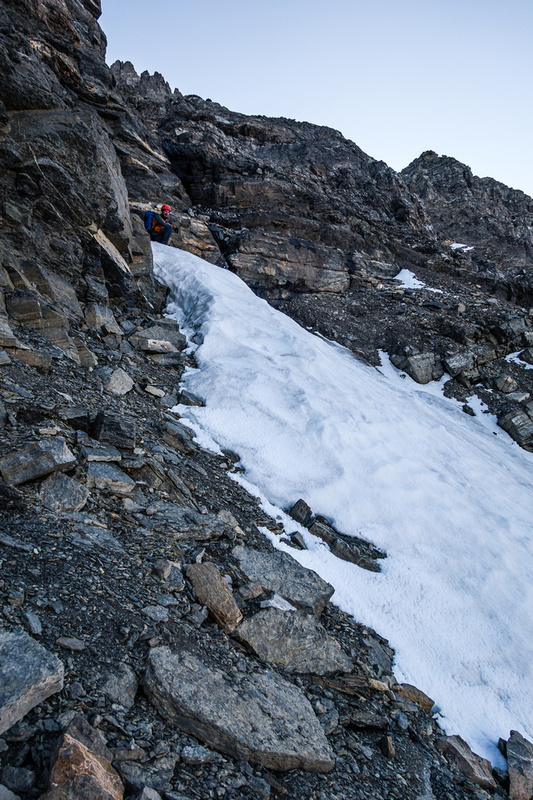 We worked our way up the gully, avoiding the sn’ice by traversing onto the loose, chossy slope on climber’s right. Right away we could tell that this was going to be a long and delicate day! Everything we touched or stepped on was loose. 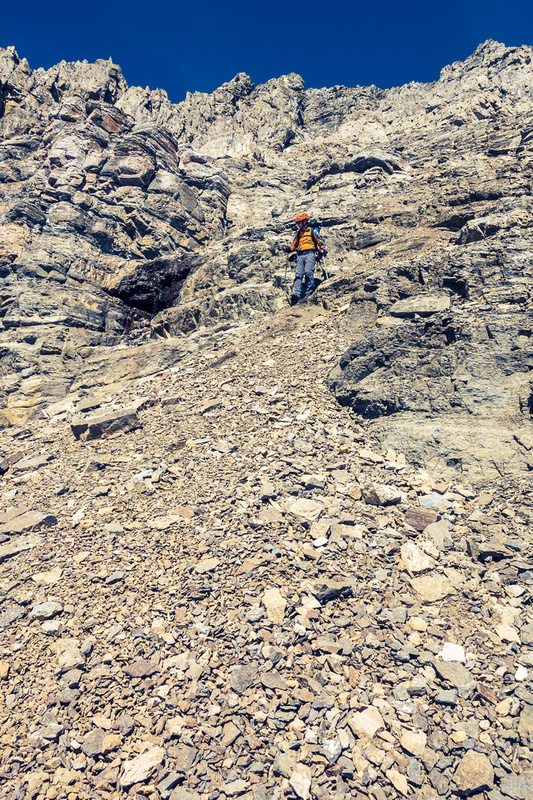 Huge chunks of scree, rock and clay crashed down the gully as we went up. 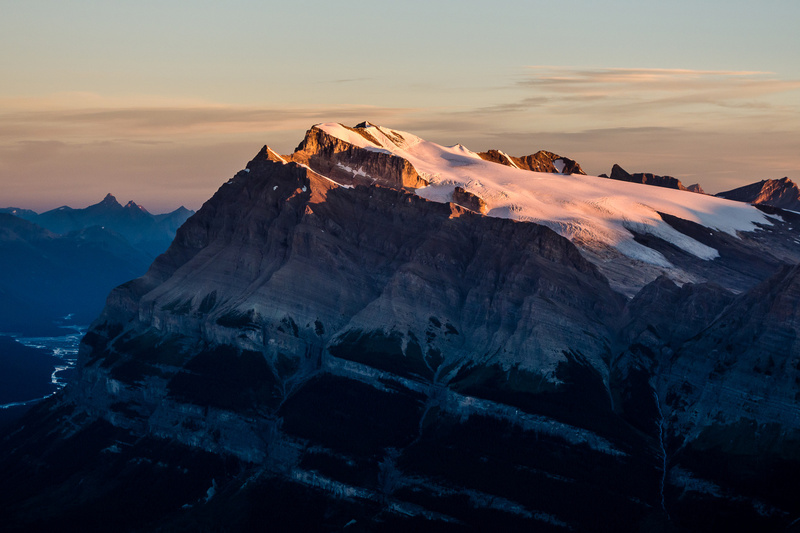 Mount Forbes (L) and the Lyells (R) with Glacier Lake glistening in the morning light. 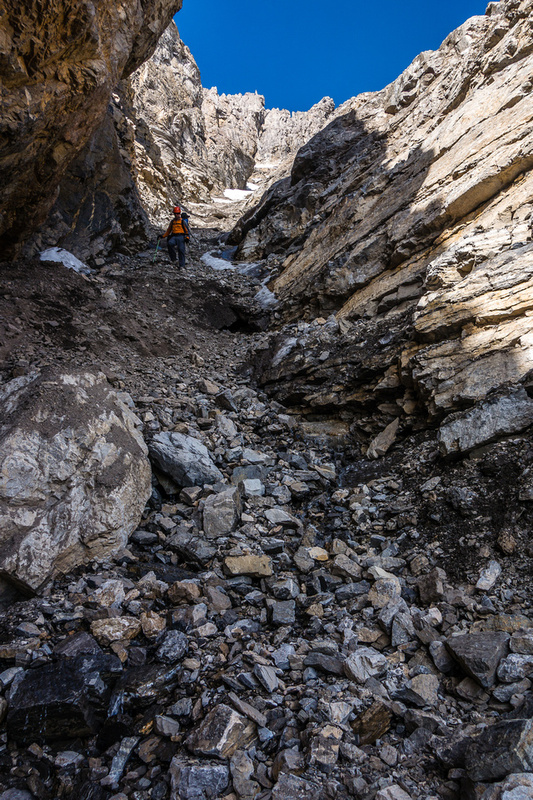 In the steep and very loose gully under the NW summit. 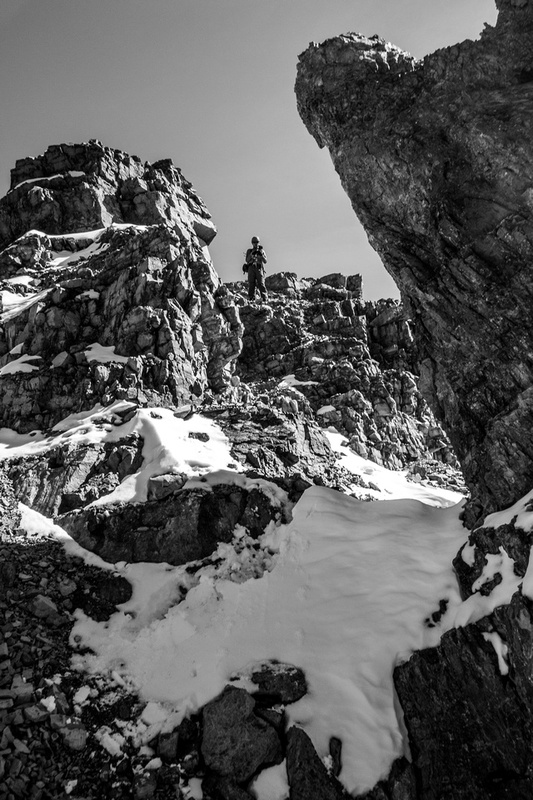 Looking back out of the ascent gully at some of Murchison’s towers. 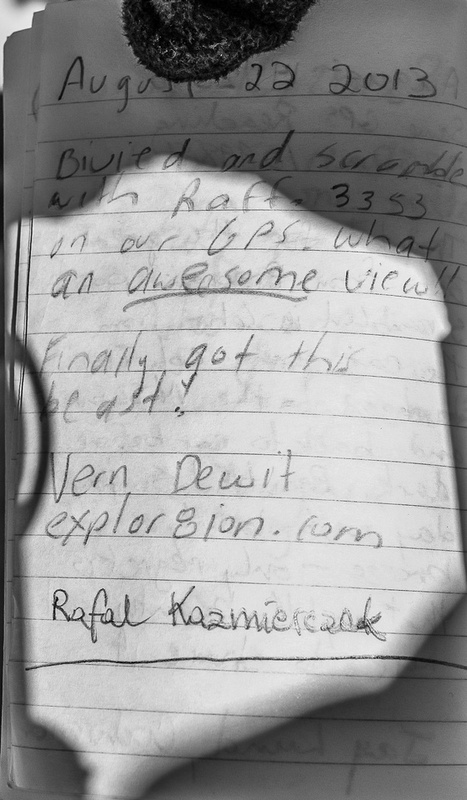 Eventually I told Raf that we had to start traversing climber’s right (east) away from the NW summit. 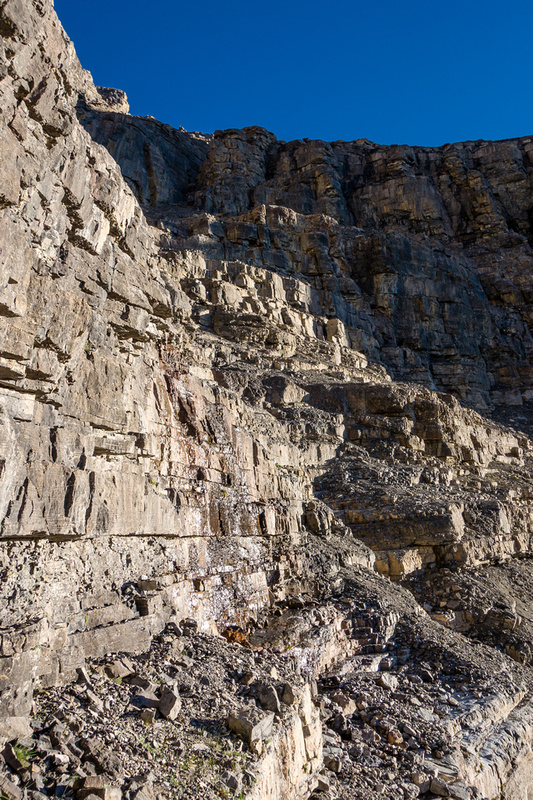 We began our traverse and spent the next 40 minutes or so traversing almost straight east without gaining too much height, on easy to moderate shale slopes. 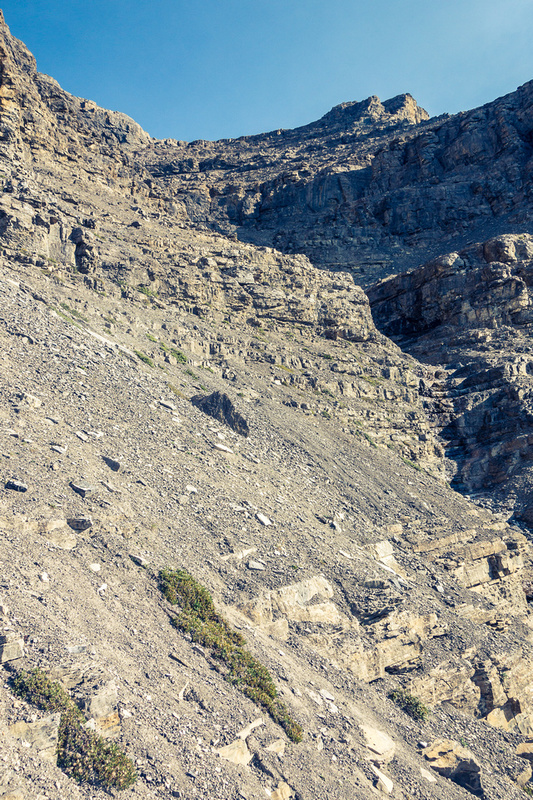 Where the scree was soft, the going was fast and easy. 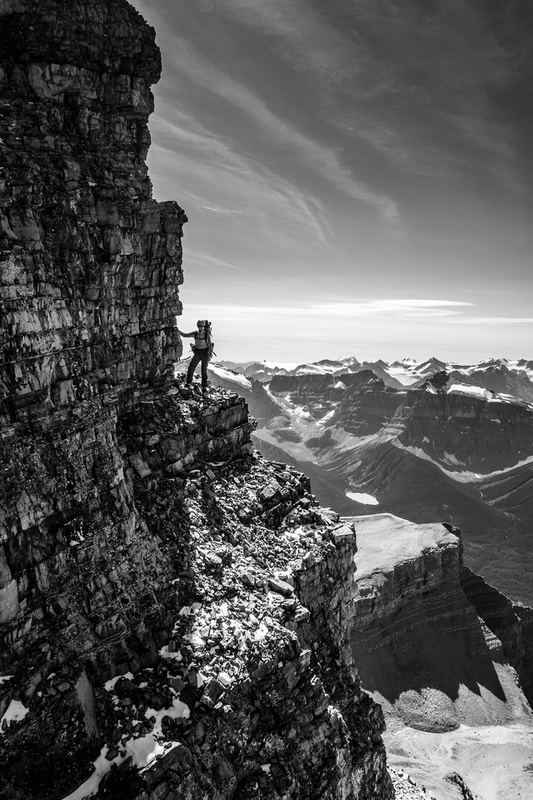 Every once in a while we’d hit cement-hard scree and slow down, trying desperately not to slide down the “cheese grater” crap. 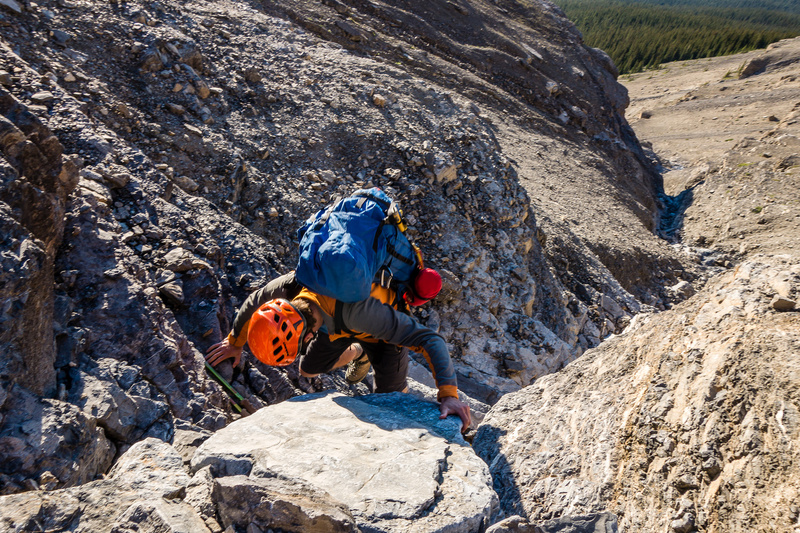 We picked a great line, under towering cliffs above and over plunging cliffs beneath. I had a way point mapped out where I guessed there was going to be another gully leading to the NW/SE summit col. 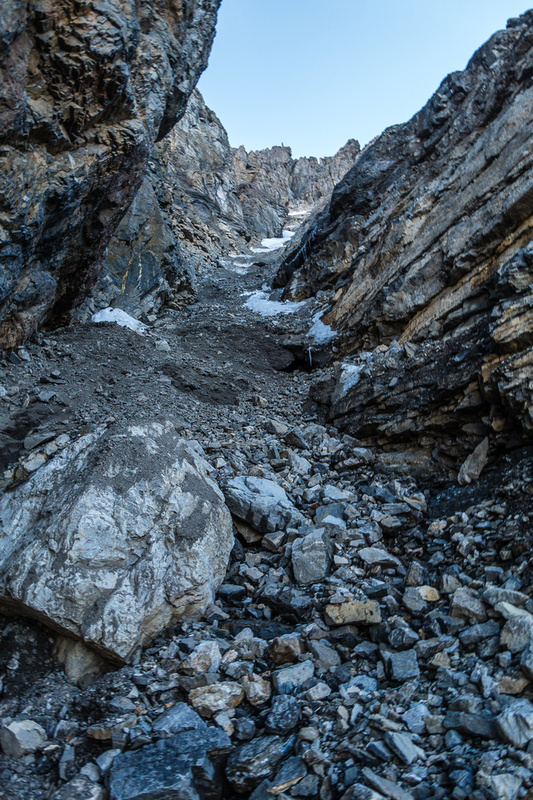 It took longer than I thought but eventually we traversed far enough to reach this gully. It was basically our last chance to reach the summit ridge high above and Raf was getting a little bit impatient to start gaining height. 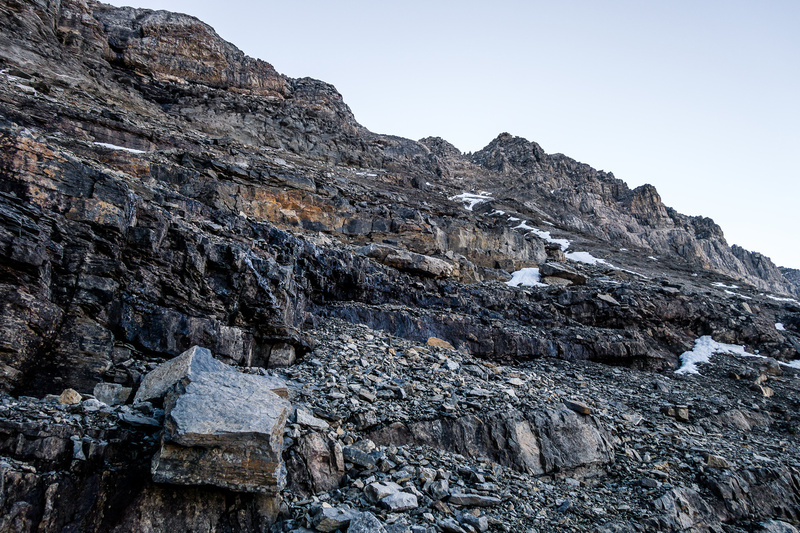 Once we hit the gully it was a steep grind on shale, scree and snow to the exposed col. 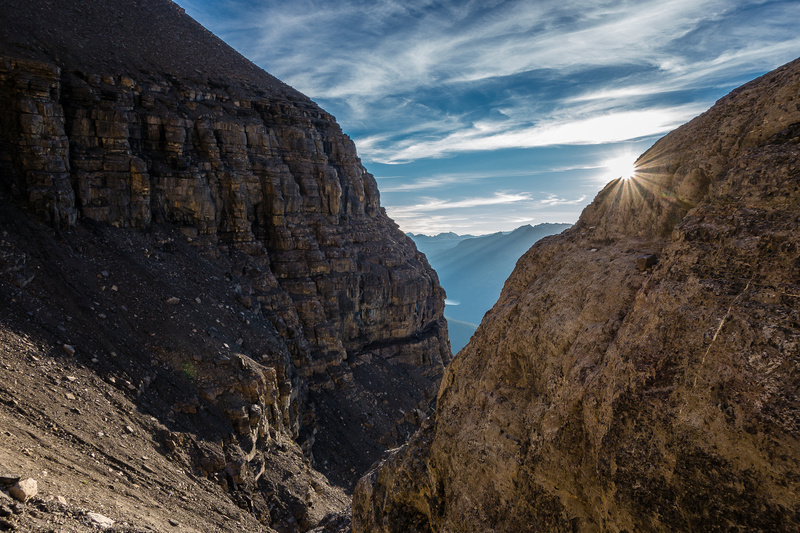 The views throughout the scrambling so far had been incredible and we were feeling really good now that we were done the trickiest bit of route finding and had avoided all technical terrain. The views aren’t too shabby looking back to the west from our traverse. 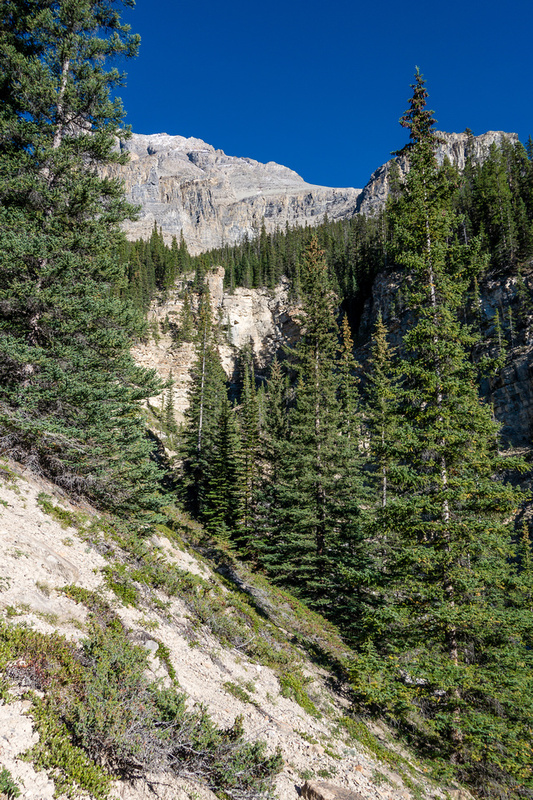 Note the pinnacles looming above us – this is the gully to the NW/SE col. 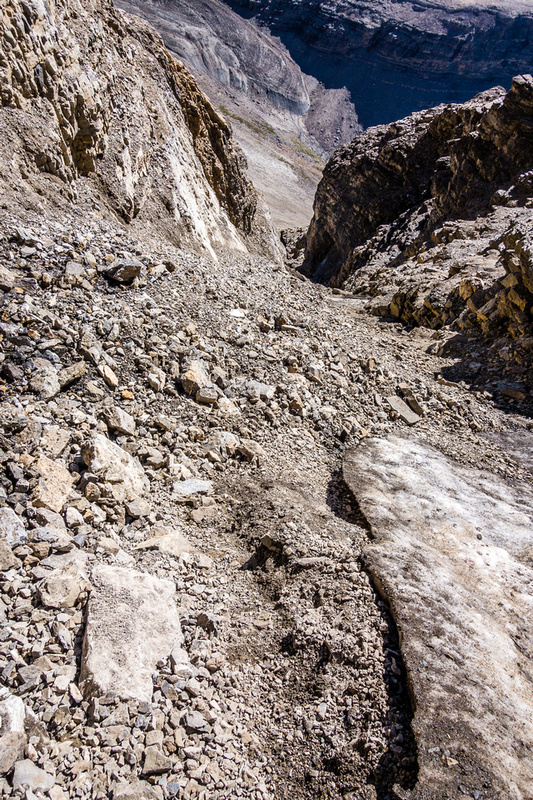 Looking down the northeast side of the col – don’t slip here. 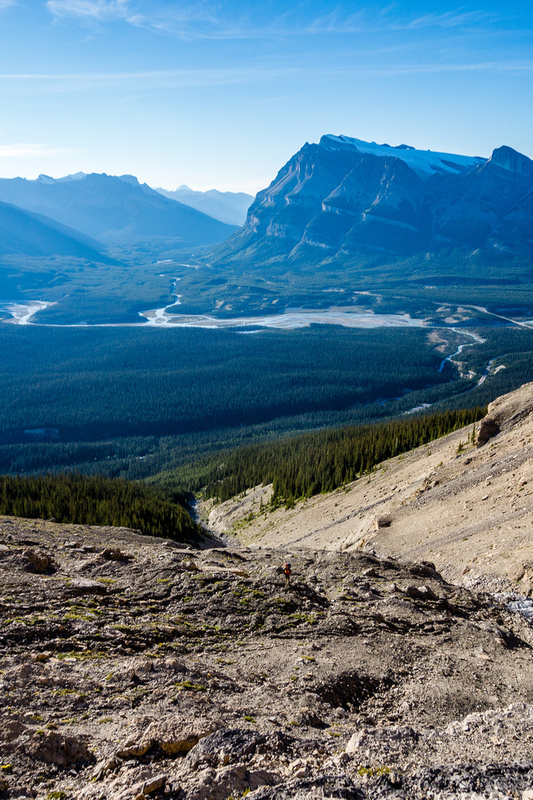 This is the remote valley that Trevor Sexsmith used to make his spring ascent and ski descent of Murchison on May 5th, 2016. From the col the route is impossible to describe with great accuracy. 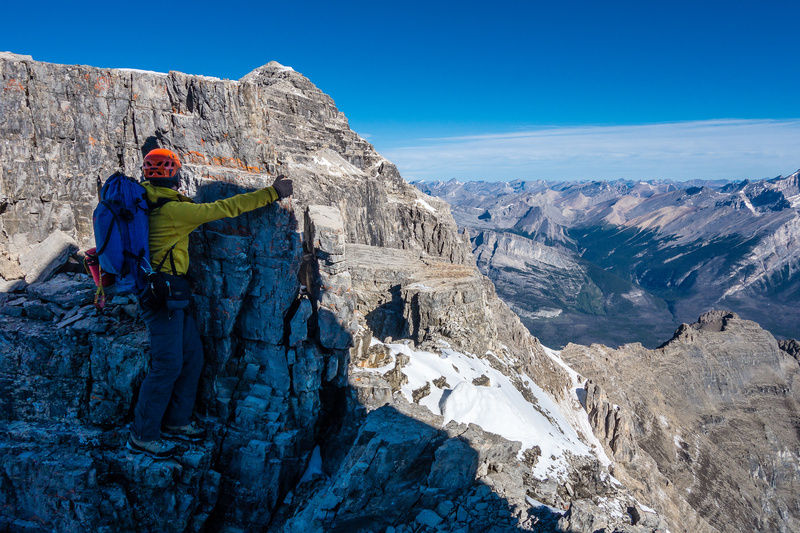 There is certainly more than one way to attain the summit but all will involve fourth class scrambling on some exposed, loose Rockies crud that you must love if you’re bothering with this climb. 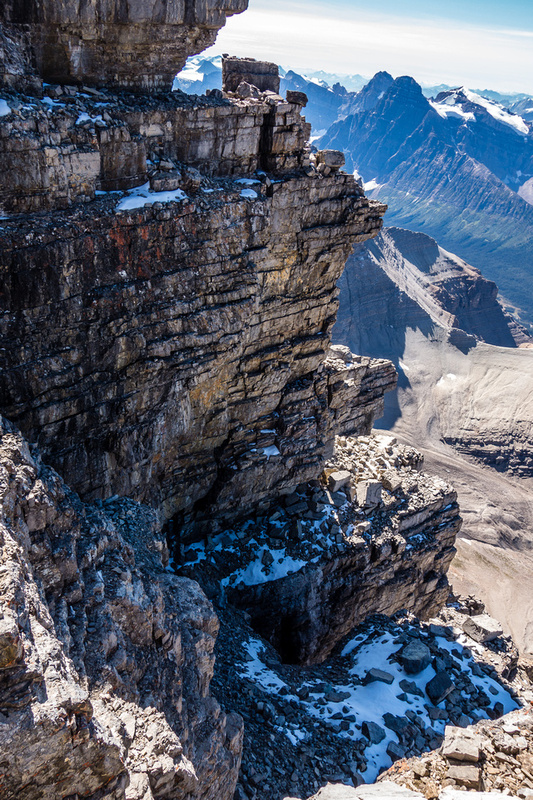 There is some exposure in places, and a fall would have serious consequences in most spots near or on the ridge. On the upper NW ridge to the summit. 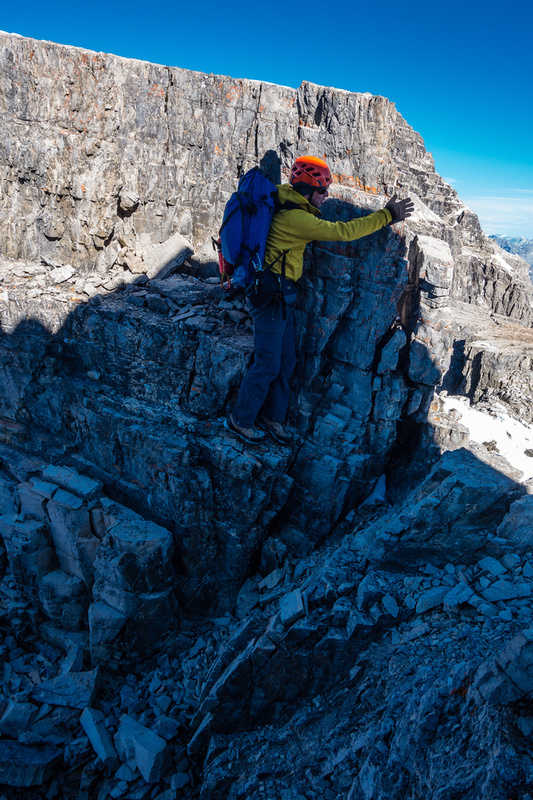 Lots of fun, hands-on, exposed scrambling on the NW summit ridge. Raf is having fun. Honestly, it doesn’t get much better than this. Perfect weather, gorgeous views and an interesting route. 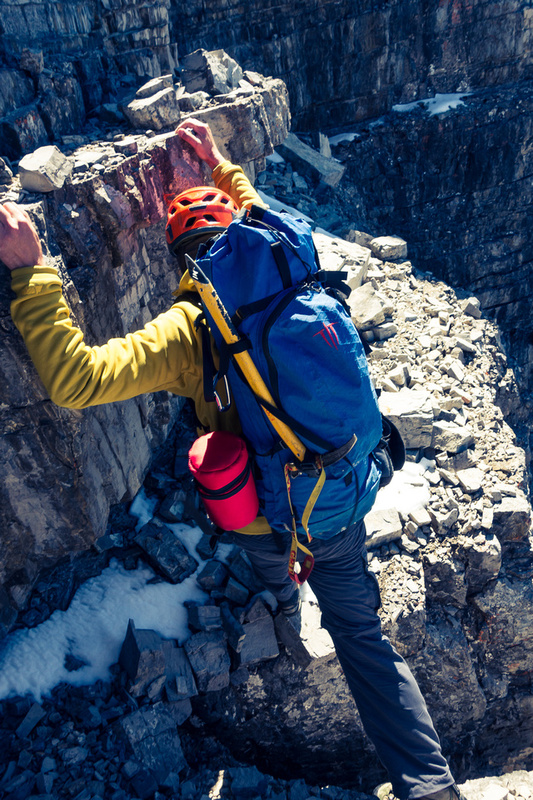 At the base of the second-to-last tower, one reaches a vertical and difficult wall: we traversed to the right on the S side, and where there are obvious breaks, scrambled up — some people may want the rope here because of the exposure; a competent leader, however, will not require pro. 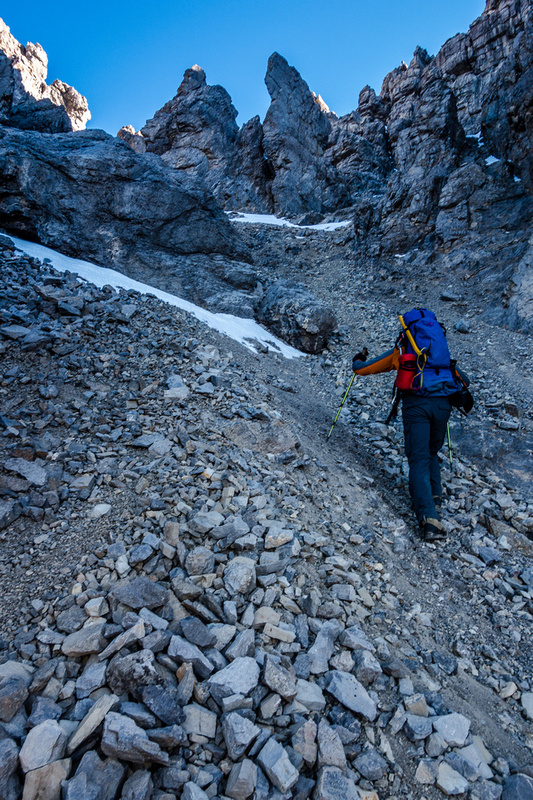 In any case, we didn’t see a huge issue with ascending the terrain – it’s always the descent that is more problematic. 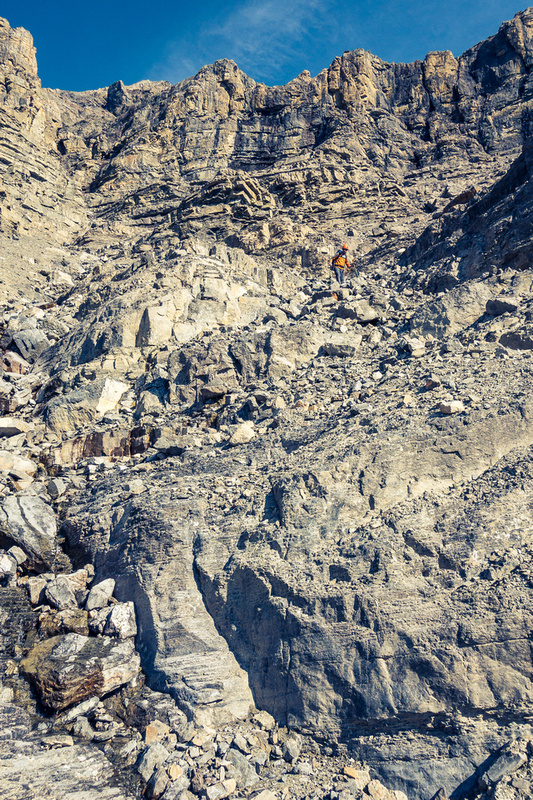 Eventually we kind of gave up trying to find nontechnical routes and just picked a place to go up – steep and exposed but possibly down climbable. If not, I had lugged the rope a long way already so using it wouldn’t be the end of things either. Eventually we gave up looking for a non-technical route and just ascended! It was pretty easy – maybe 5.1 or 5.2. 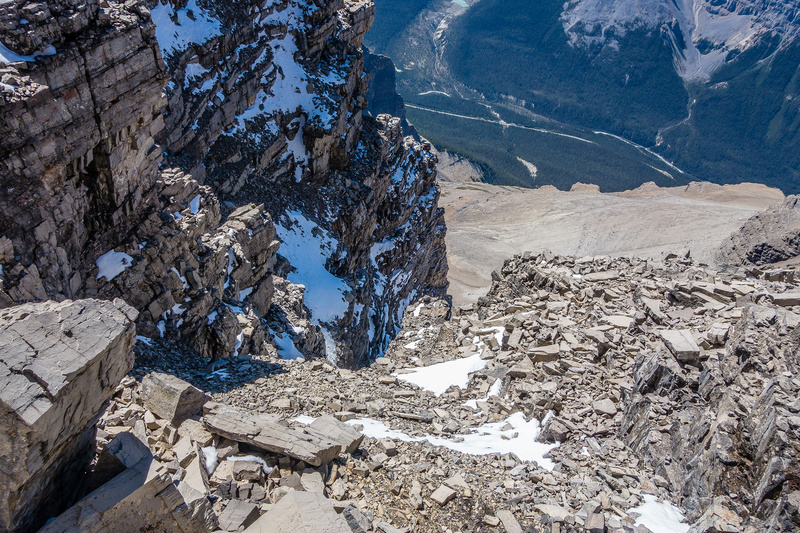 A view down off the summit as Raf approaches the highest point on Mount Murchison. We are clearly higher than the NW summit in the distance. 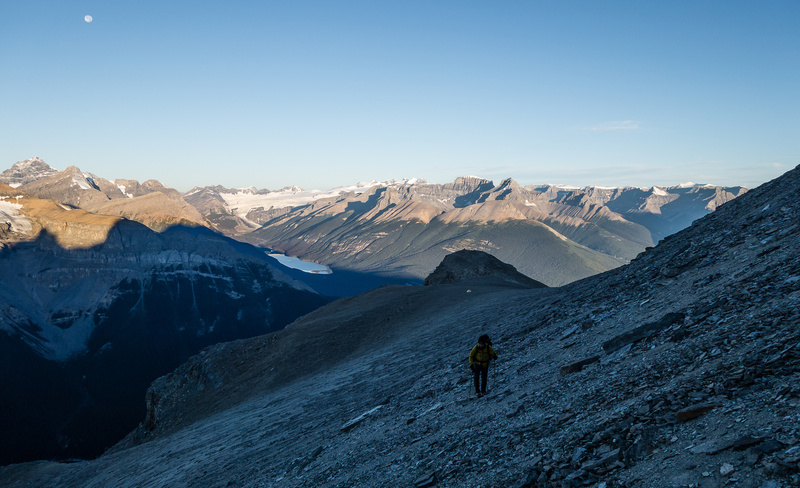 Once up this section we dragged ourselves over a few more bumps and found ourselves standing on top of Mount Murchison – around 4.5 hours from the time we left our bivy. 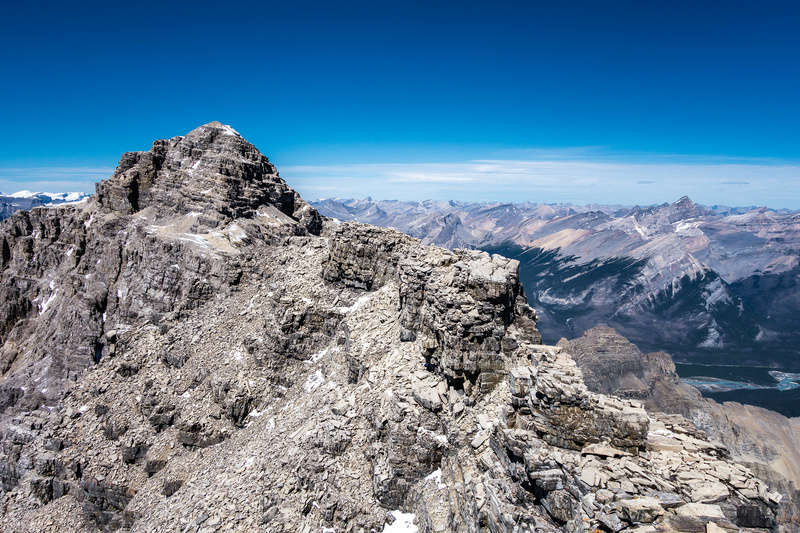 The summit views were stupendous – more than making up for some more limited views on Recondite’s summit the weak previous. 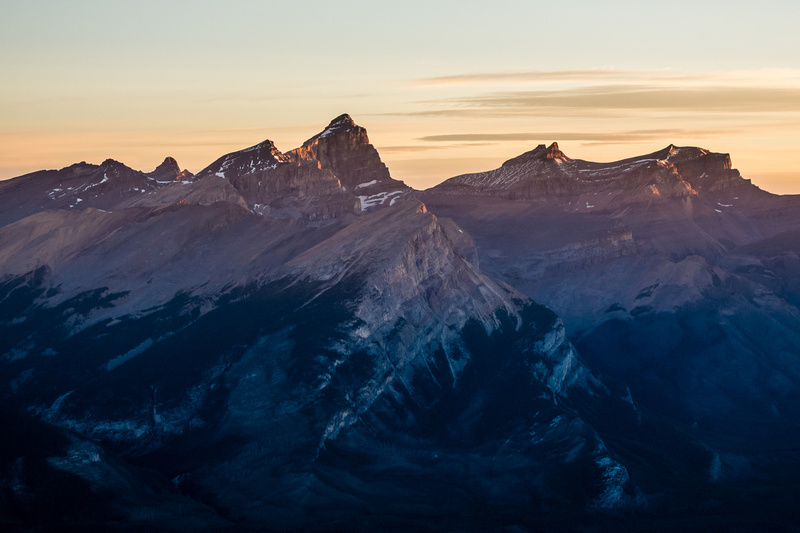 I’ve spent so many hours day dreaming of Murchison’s summit that finally experiencing it was surreal. I was really proud to be on top of this giant hunk of chossy, crumbling rock. 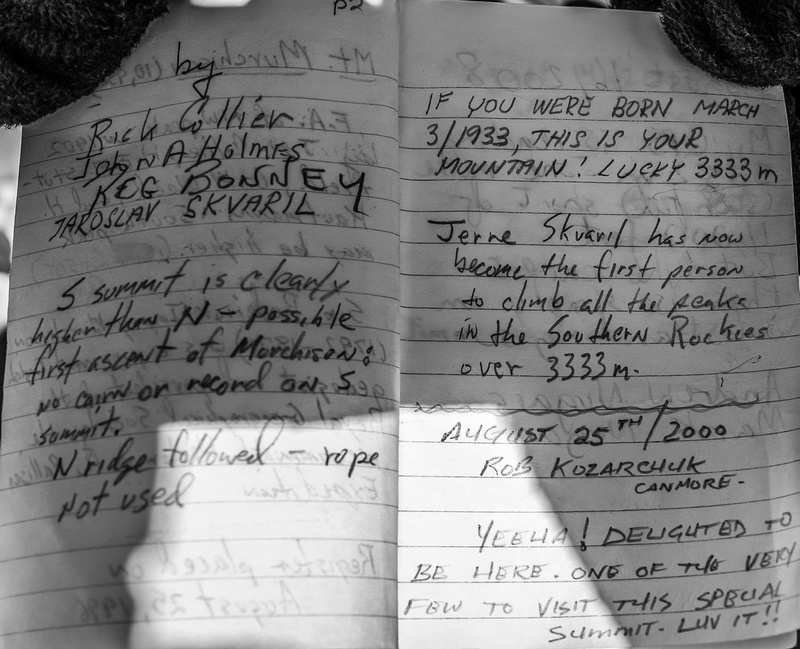 The summit register contained a surprise too. Remember the possible tracks / pole marks we’d seen coming up the amphitheater? 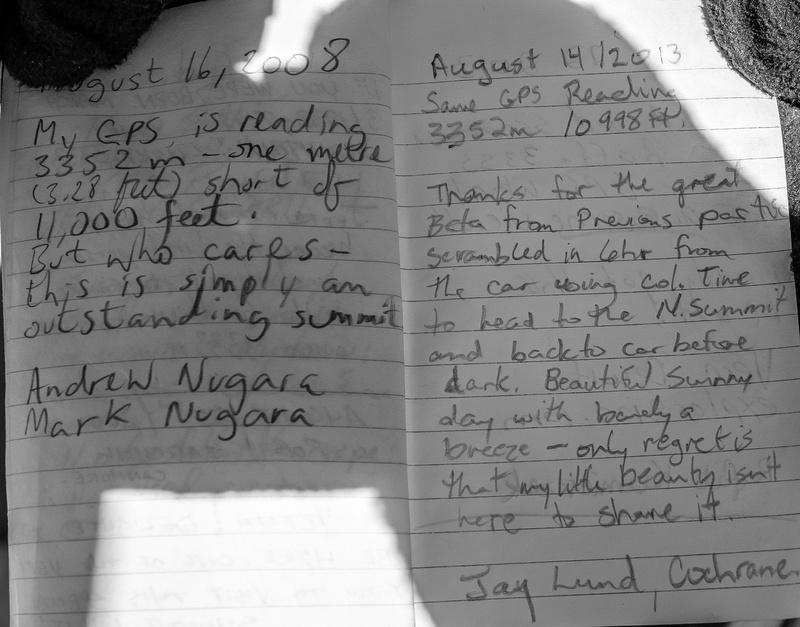 Well, after zero ascents for 5 years since Andrew and Mark’s 2008 entry, there are now two entries for 2013! We were beat by a week to be only the 4th party in Murchison’s register, but 5th still isn’t bad. 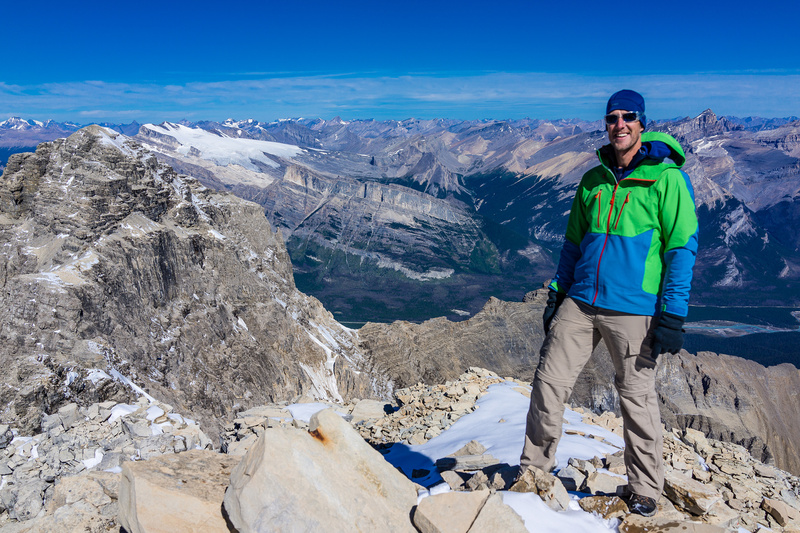 Jay, from Canmore, only took 6 hours to ascend from the parking lot – an impressive feat. 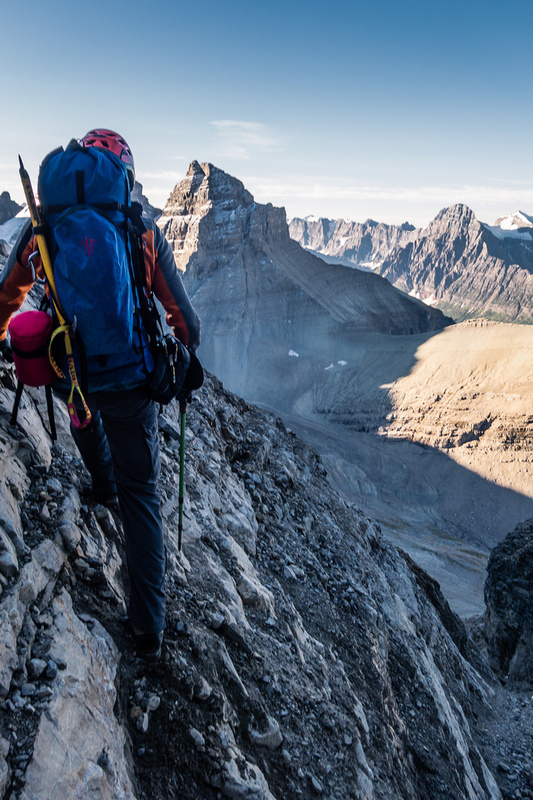 Without bivy gear and with excellent route finding this is a good pace – count on longer if you’re trying to day trip this mountain. After spending 45 minutes taking photos and enjoying the summit glow we reluctantly decided it was time for the real fun to begin – going back down all the loose crap we’d just ascended. 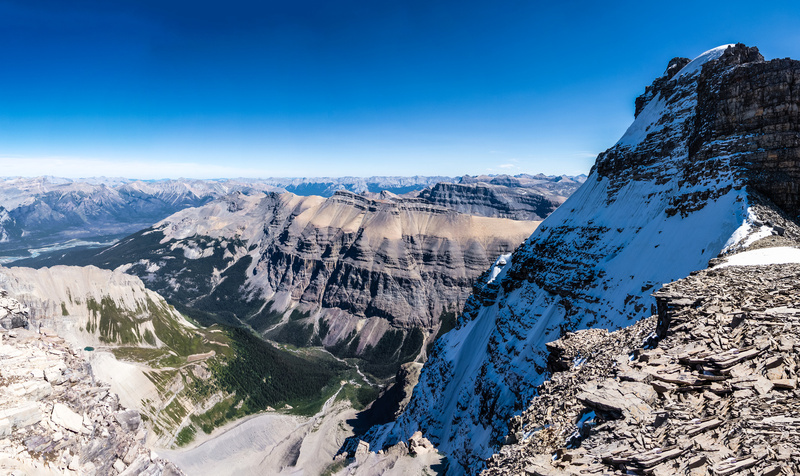 A very impressive summit panorama looking east (L) and south (R) includes Elliott Peak, Corona Ridge, Siffleur, Peskett, Loudon, Marmota Peak, Quill, Hector, Chephren, White Pyramid and the various Murchison towers in the right foreground. 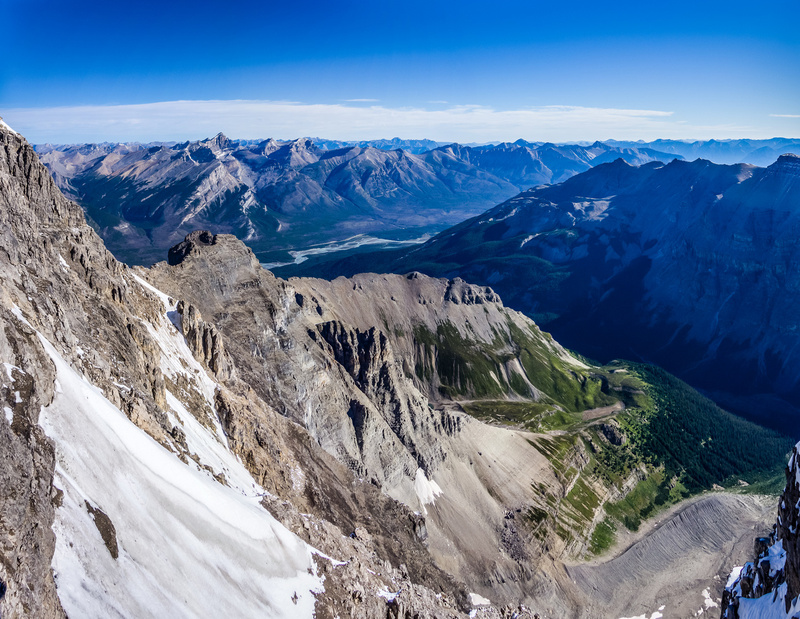 The NW Summit with Mount Wilson, Cirrus, Stewart, Cline, Resolute and many others visible across the North Saskatchewan River and the David Thompson Highway. 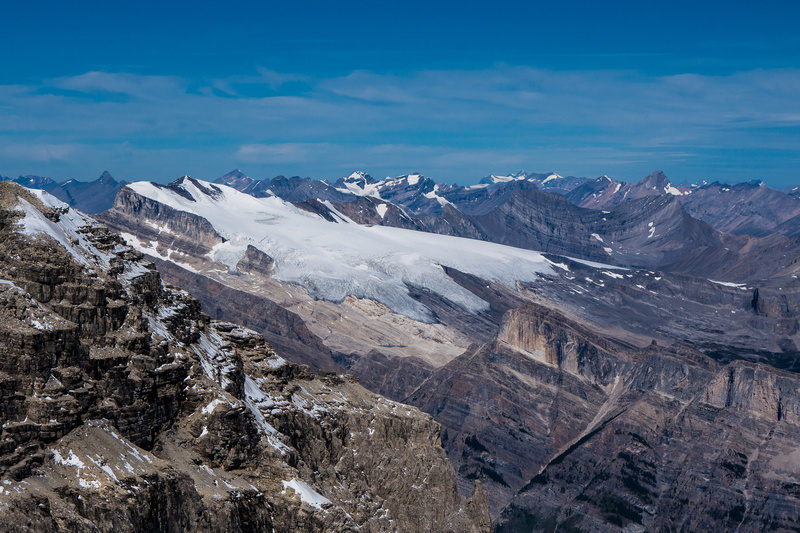 Looking west over our bivy at lower center towards Glacier Lake and the Lyell Icefield. Kaufmann Peaks and Sarbach at left with Forbes rising over them. Mount Columbia at far distant right. 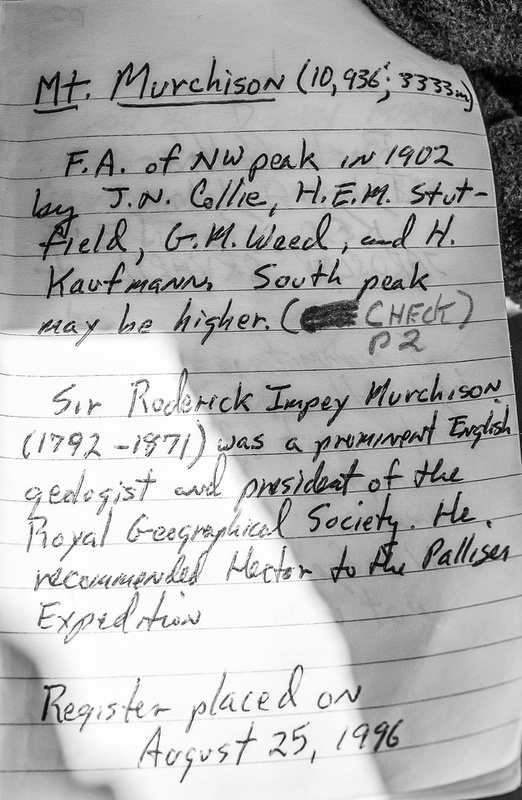 So now you must be wondering – how high did our GPS’s measure Murchison’s highest summit? Based on the register entries and our own readings, I think the summit is almost certainly very close to 3353 meters. 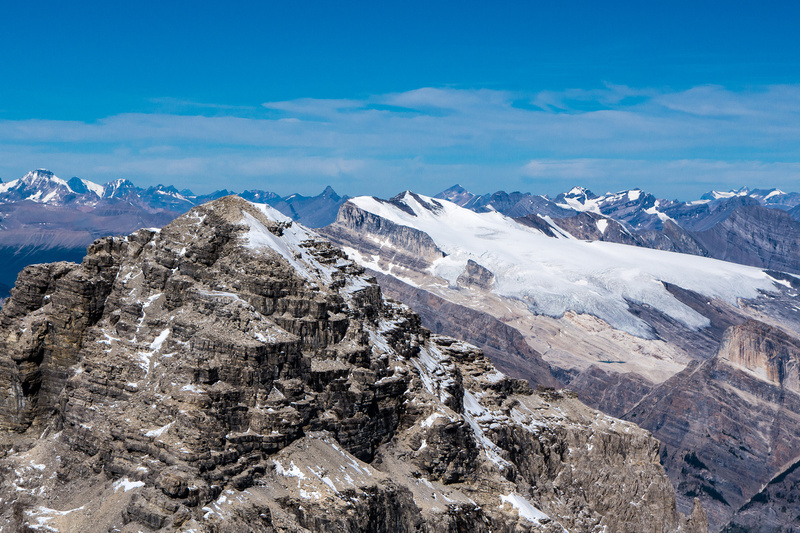 Our GPS units jumped as low as 3352m and as high as 3360m while we were on the summit. Since I can’t really claim an 11,000er independently of an official list, I will only say the SE summit is around 11,000 feet. I won’t be surprised in the least if this gets changed officially to 11,000 feet or more in the future. It is most certainly well over the official (lower summit) height of 3333 – of that there is no doubt. Of course, in the end – who cares? 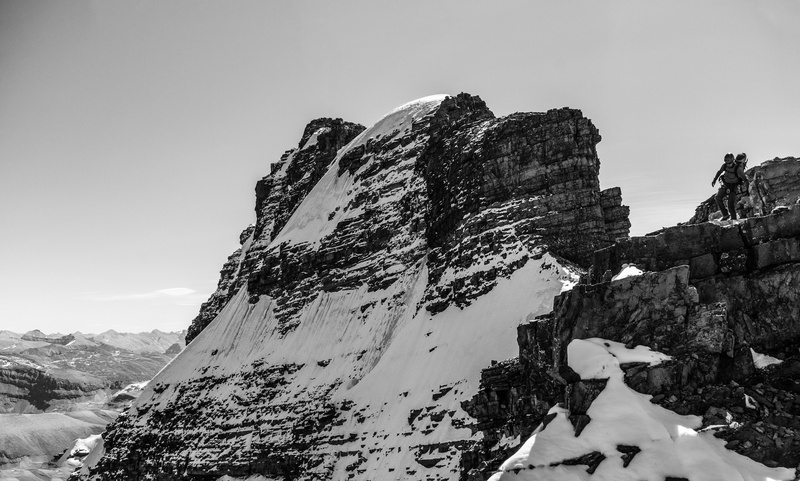 It’s a massive mountain with very few ascents, high visibility from and to everywhere around. 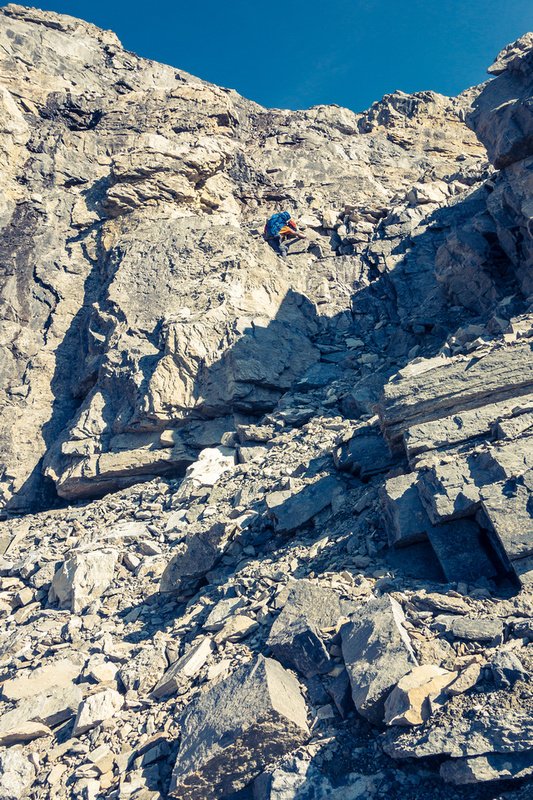 It’s fun, tricky scrambling with a stupendous bivy site. What more does there really need to be? Making Murchison an 11,000 will result in much more traffic but won’t change my experience on it at all. Brilliant views west over Epaulette Lake. 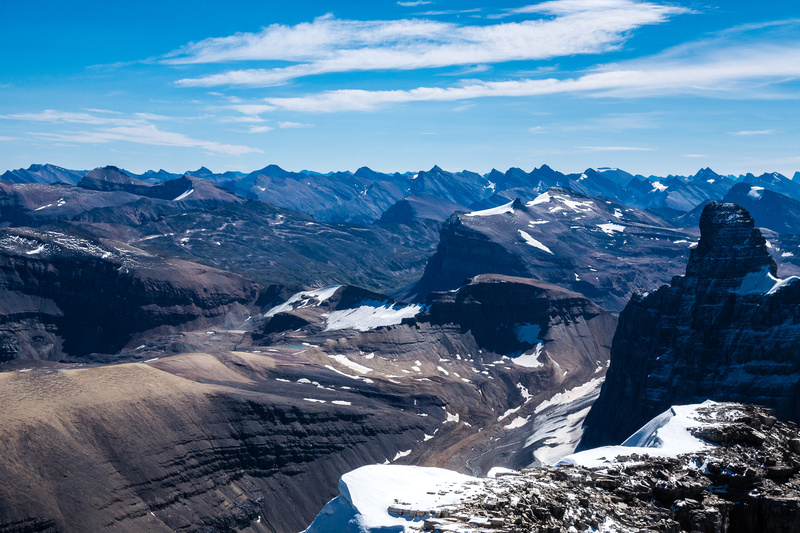 The Wapta Icefield at distant left. Howse, Chephren and White Pyramid at center with Mummery at distant center. Looking over the NW summit at Wilson (L), Stewart (C) Cline and Resolute (R). The descent was, as expected, not much faster than ascent and tricky in places. 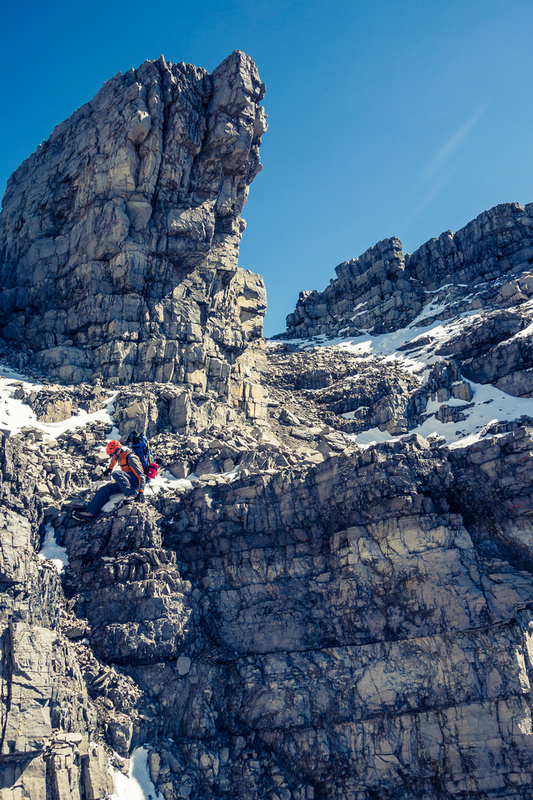 When we got back to the crux, just beneath the summit we tried repeatedly to make the one awkward move necessary to reach a ledge beneath us but we just couldn’t do it. There was a slight overhang and we knew we had a rope so we didn’t want to be stupid about it and end up falling onto the icy ledge beneath. 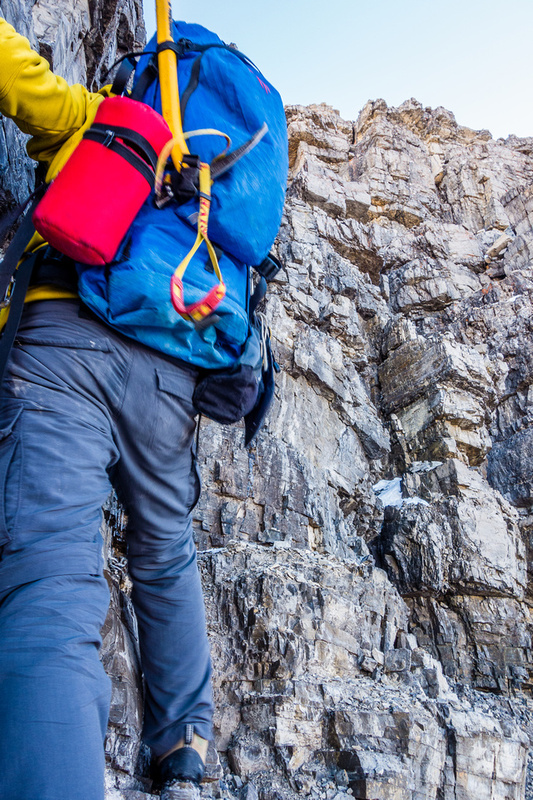 Eventually we decided that a rappel would be the safest option and started looking around for something reasonably anchored to the mountain to use. 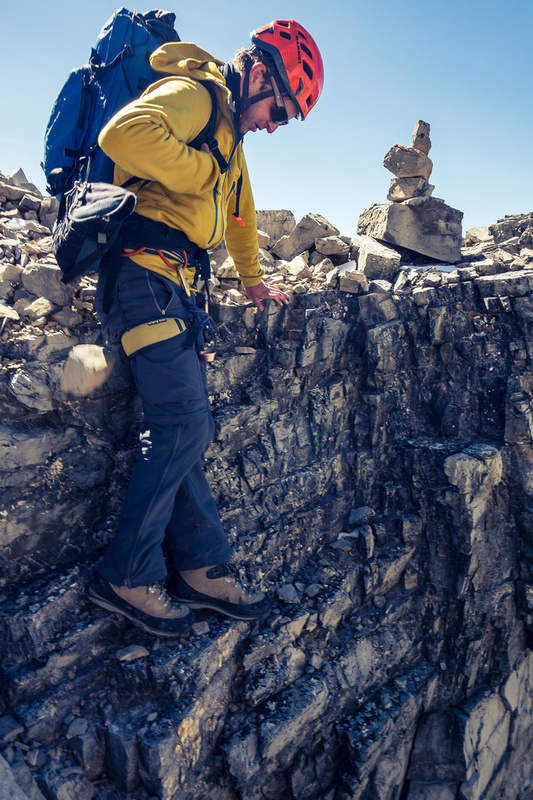 The first few objects we tried were too loose and I started taking my pack off – volunteering to downclimb without the pack, when Raf found a nice solid(ish) rock horn that would do the job nicely. We even managed to back up the horn with another reasonable sling and soon we were down the crux. Raf rappels the crux on descent. The terrain above Raf here, may have avoided our crux (which is out of sight to the right) but we’re not sure. 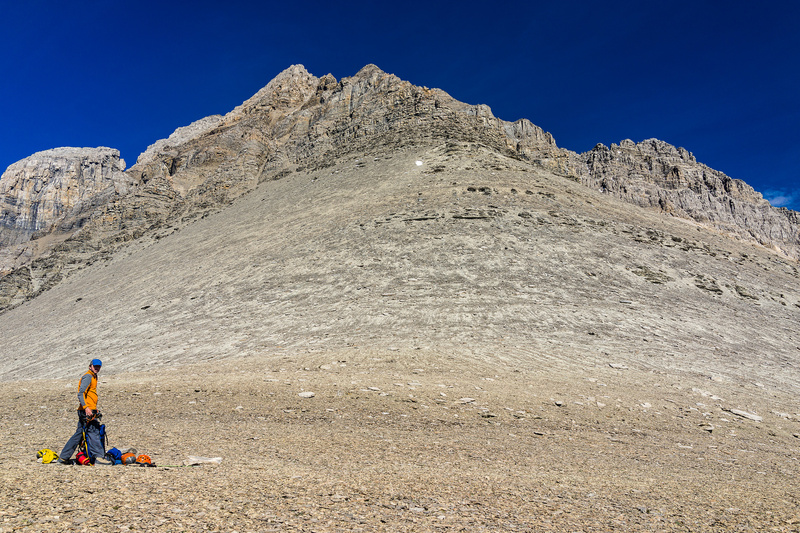 The rest of the descent to the bivy site was long, loose and tiring but also fun trying to find our cairns from ascent back and basking in the glow of a successful summit. 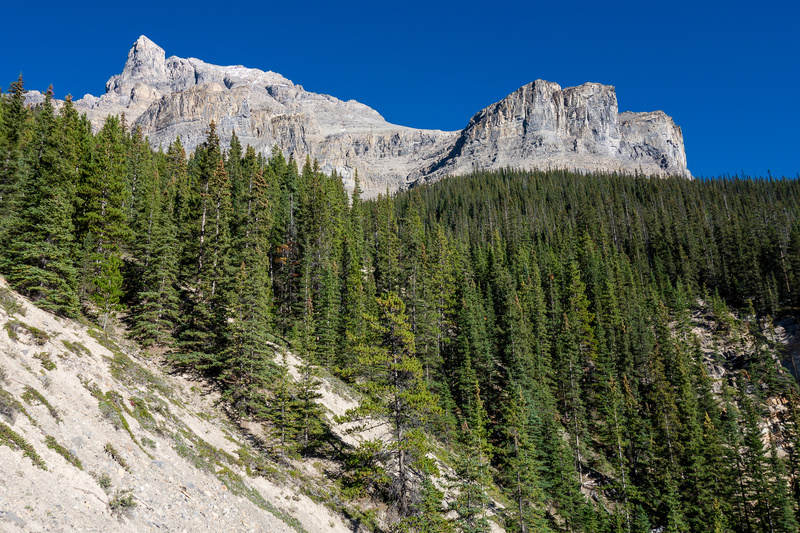 Once back at the bivy we packed up and headed back down the amphitheater to the approach creek and highway. The descent of the amphitheater took longer and was slightly harder than I thought it would be. Thank goodness for cairns again (ours from the ascent) because the route wasn’t obvious and we forgot a lot of it, thanks to already spending over 8 hours on the mountain. Cairns we put up on ascent were invaluable for finding our way back again. Raf descends to the col from the NW ridge. 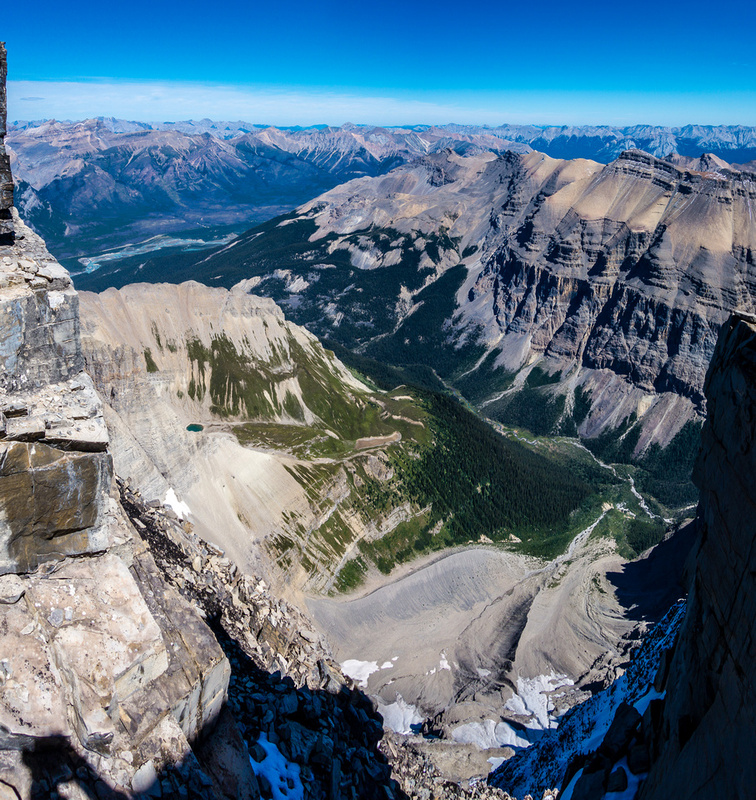 One of my favorite shots from the trip – coming off one of the ledge traverses under the ridge. Raf descends the south slope of Murchison. It felt really good when we finally stumbled back onto highway 93. Our summit day took us around 11.5 hours so in theory you could probably complete a day trip of Murchison with good beta and GPS way points in about 12-16 hours. 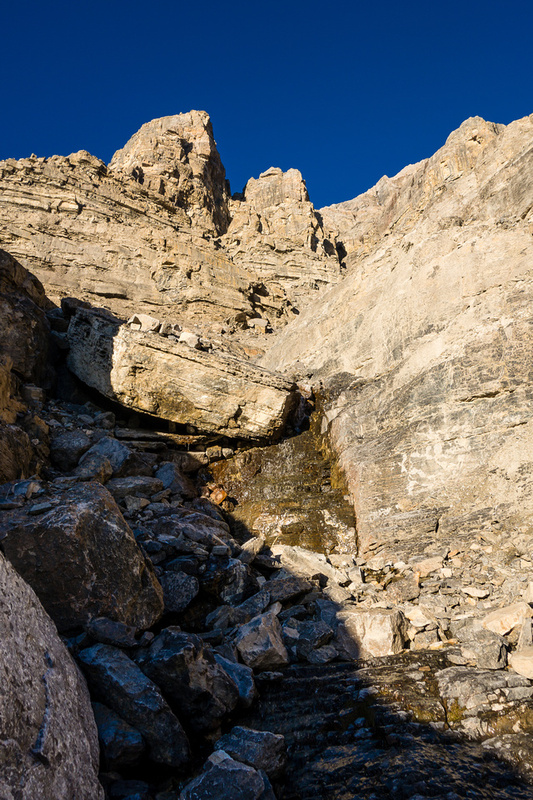 Lots of slabby terrain with loose rock in the amphitheater, but at least there’s refreshing, running water. Compared to many other peaks, Murchison is an interesting one for me to commiserate. The views rank it right up there with the best but the rock is so loose that I can’t really say the scrambling / climbing was that great. Still, it’s an awesome peak to have done and with a 5th recorded ascent and one of my most anticipated summits yet, one of the highlights of 2013 for me. A groggy Raf reluctantly unzips his warm tent to take in the morning views. And that cold morning wind. 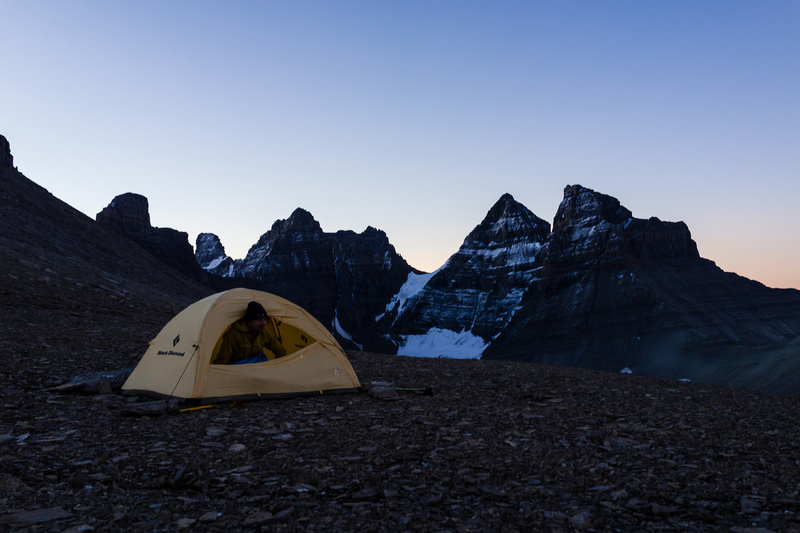 Early morning pano from the bivy. 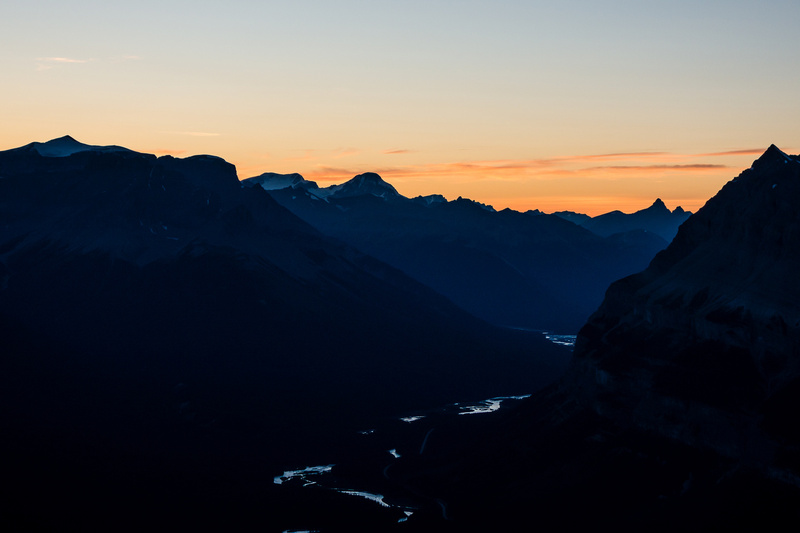 Sunrise on the Lyells above Glacier Lake. 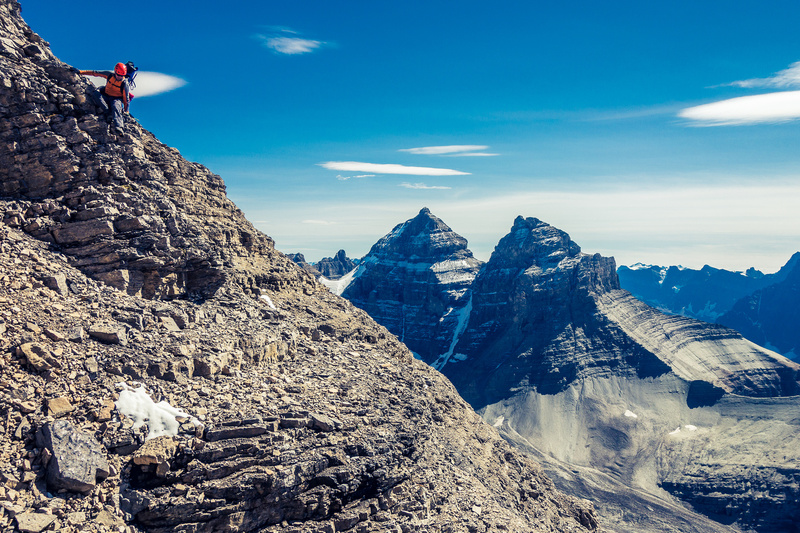 Mount Wilson is an impressive massif on the other side of Saskatchewan Crossing. 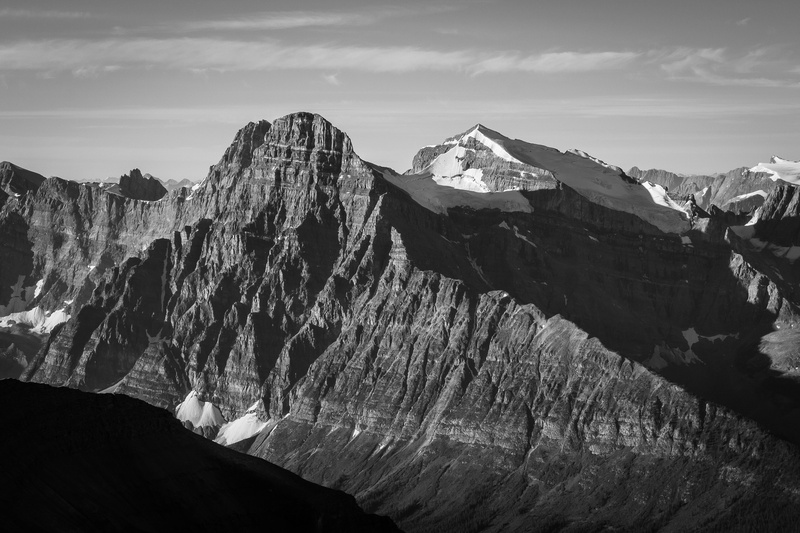 Mount Cline with Lion and Lioness to the right. 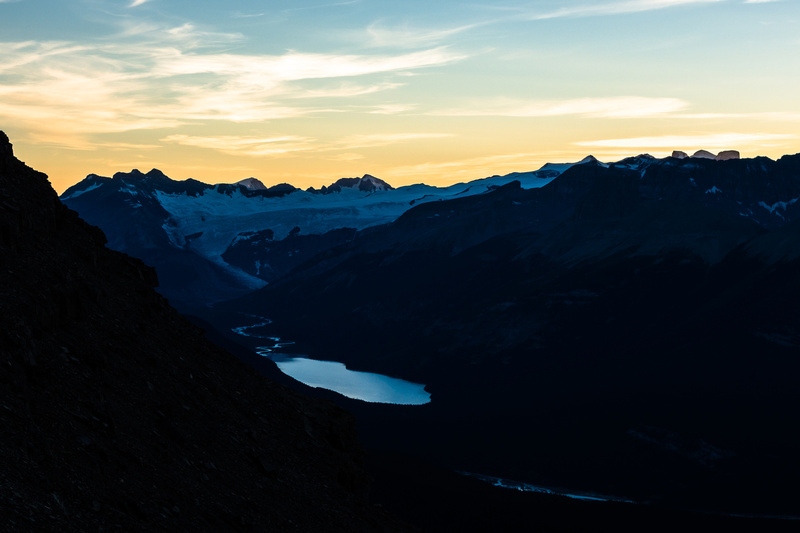 Sunrise on the Lyells over Glacier Lake. The moon is still setting at upper right as Raf follows me up the south slopes. 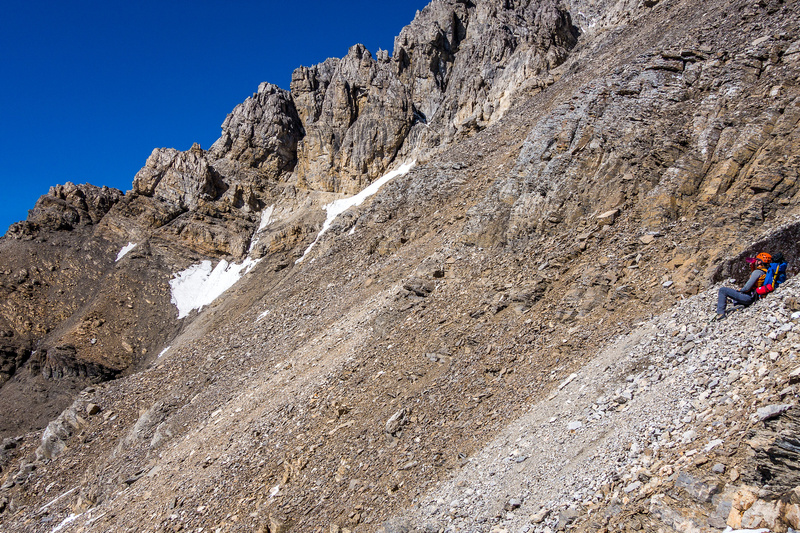 NOTE: Our route did not ascend the snow patch on lower right but that could be a workable route. 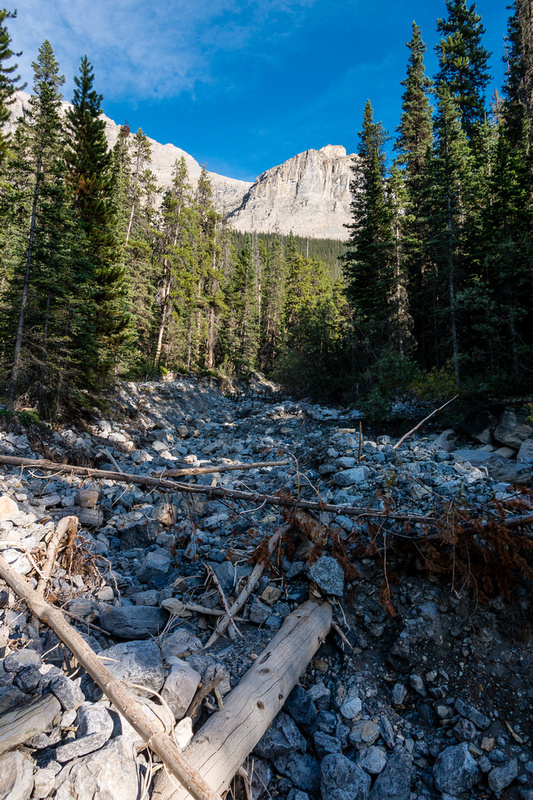 The gullies on Murchison are debris-filled and can have ice in them even late in the season. 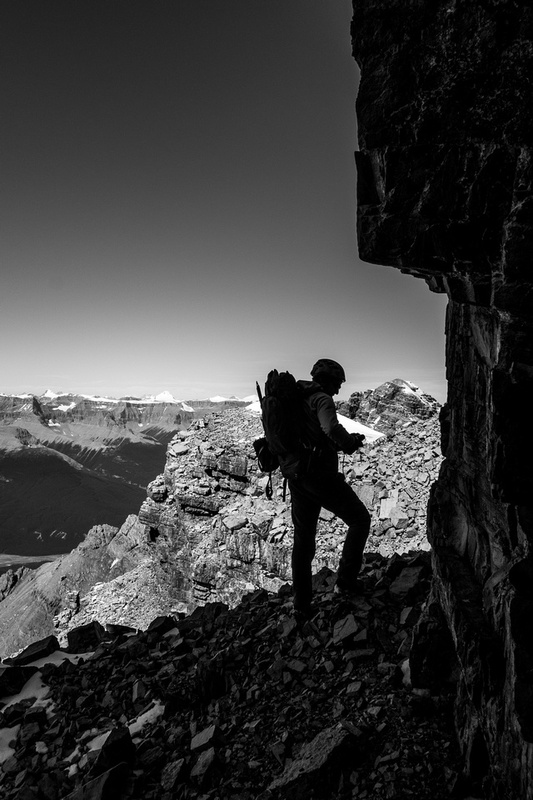 Looking back out of the ascent gully at some of Murchison's towers. 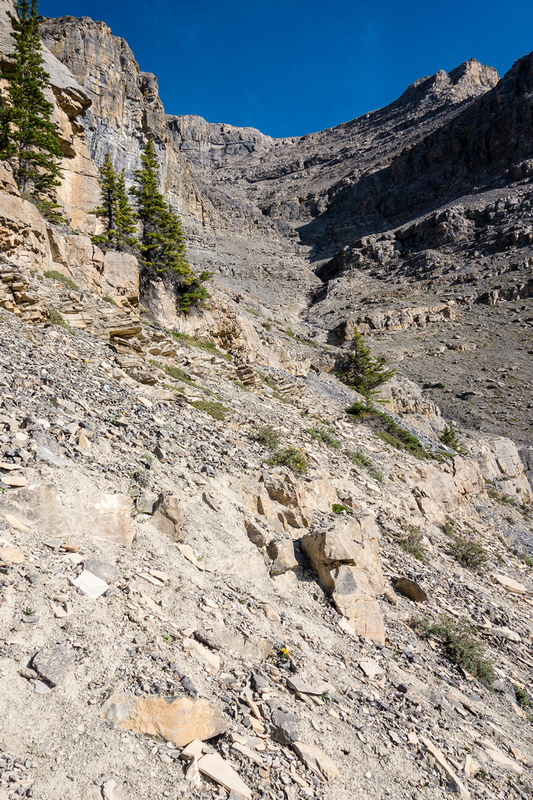 Traversing back out of the gully (to our right) on steep ledges covered in scree. Looking across the broken south slopes towards the summit. 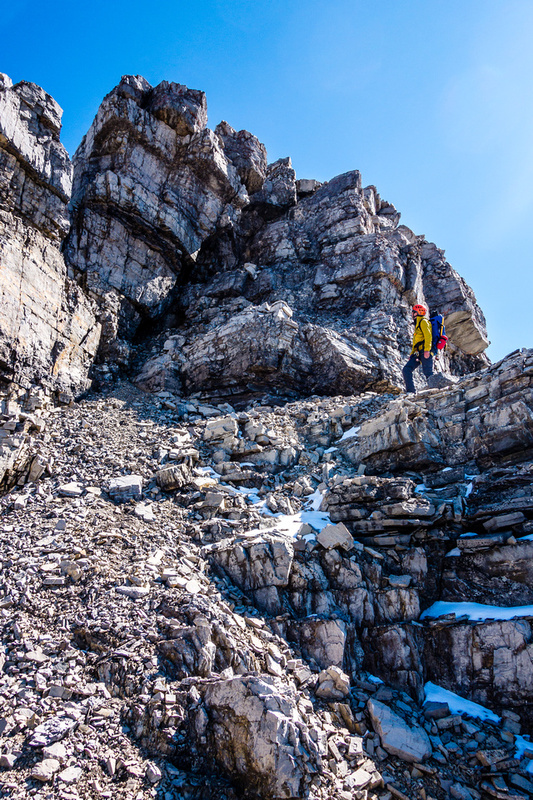 Traversing the southwest face on a mixture of snow, scree and boulders. Looking west to the Chephren / White Pyramid Massif. Great view of Chephren (L) and White Pyramid (R). 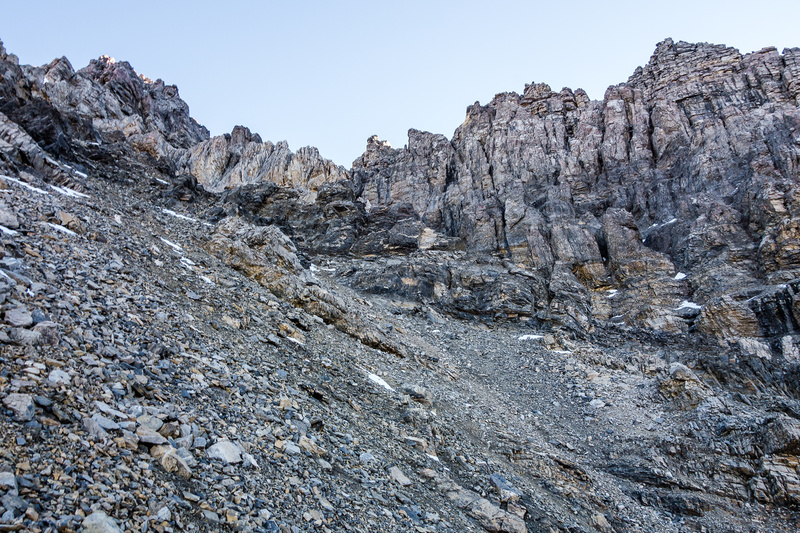 We traversed this terrain - you can make out the twin 'horns' high above our eventual ascent gully at center here. We traversed several gullies before reaching the correct one. We left cairns behind to guide us back. 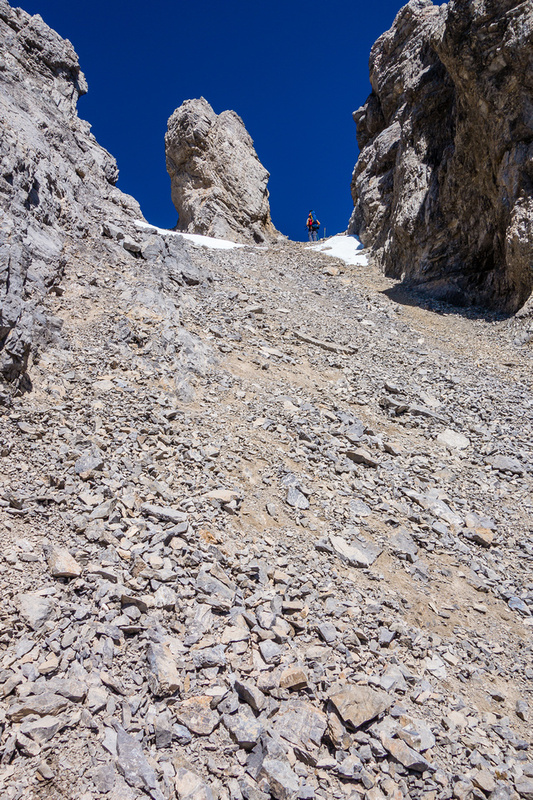 Note the pinnacles looming above us - this is the gully to the NW/SE col. 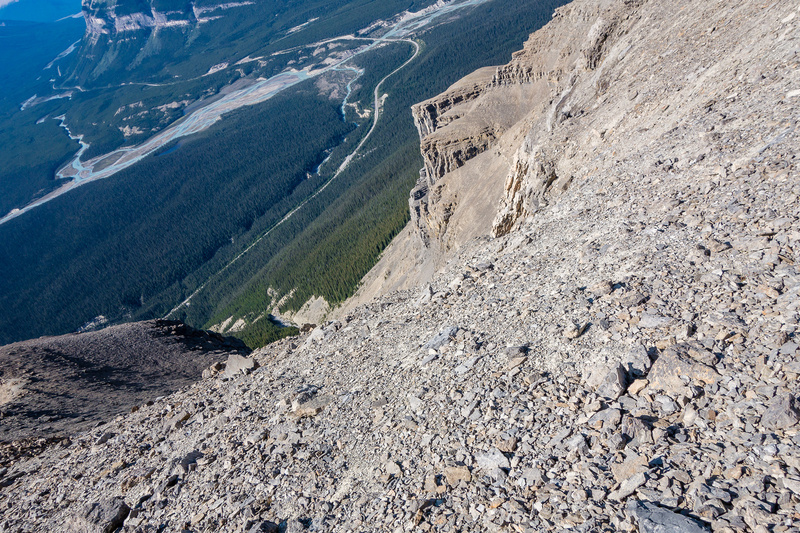 Looking down the northeast side of the col - don't slip here. 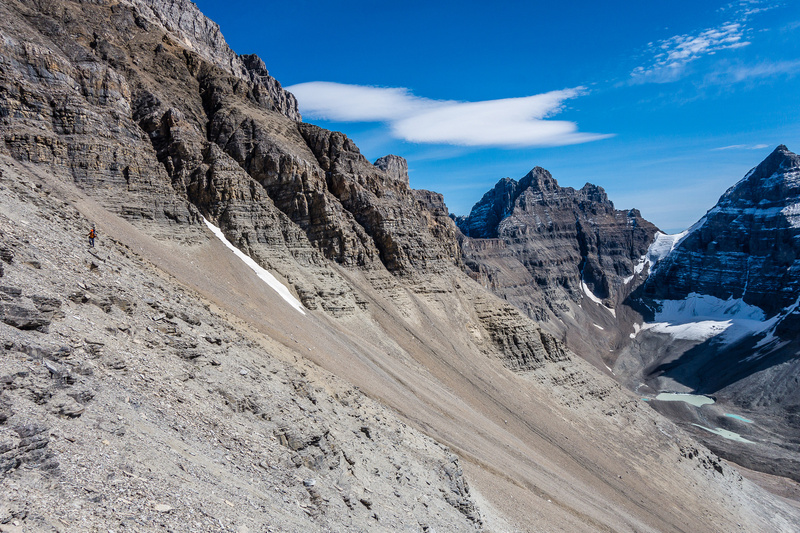 The terrain that you'll have to rappel if you come down from the NW summit to the col. The summit seems a long ways off from the col. Impressive terrain along the ridge from the col, looking across the north face towards Corona Ridge. 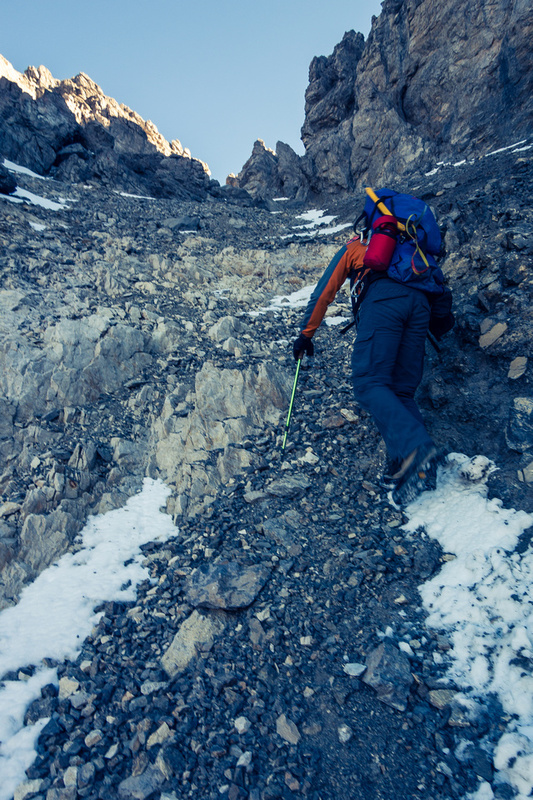 Route finding is key to keeping things easy on Murchison. Easy'is relative of course! Note the fresh snow on route. When the ridge crest became 5th class, we detoured to the south side and traversed before going back up again. Lots of fun, hands-on, exposed scrambling. Views off the ridge - the NW summit on the right. Wait a minute.This is starting to feel like an 11,000er. Raf is having fun. Honestly, it doesn't get much better than this. Perfect weather, gorgeous views and an interesting route. 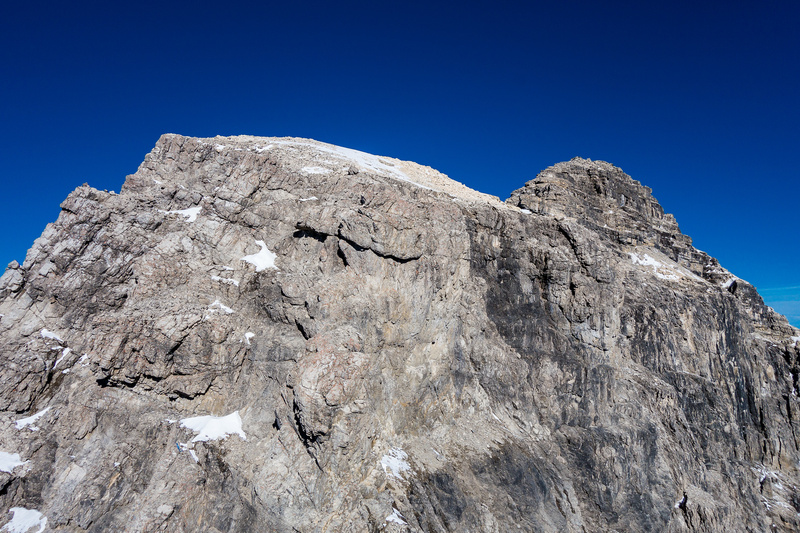 We contoured around the summit block on climber's right before ascending. 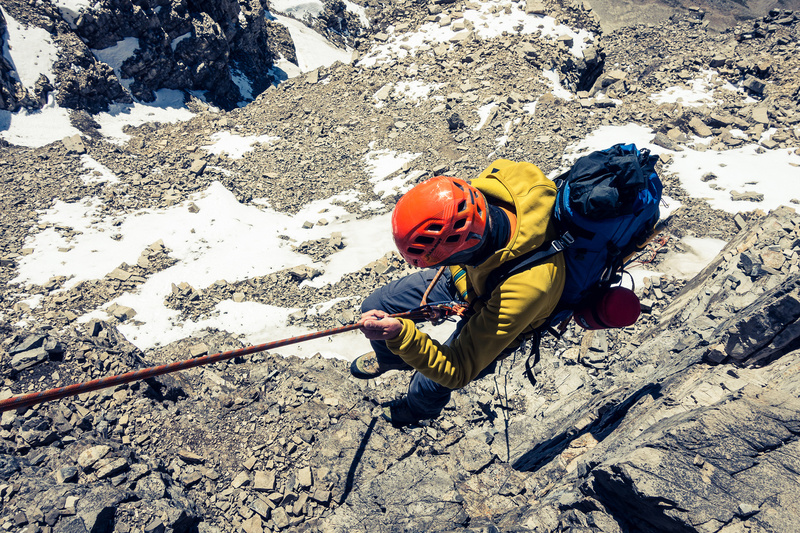 Raf comes around yet another traverse off the ridge crest as we search for an easier way up. Eventually we gave up and just ascended! It was pretty easy - maybe 5.1 or 5.2. What a day! Clearly the north summit is lower now. 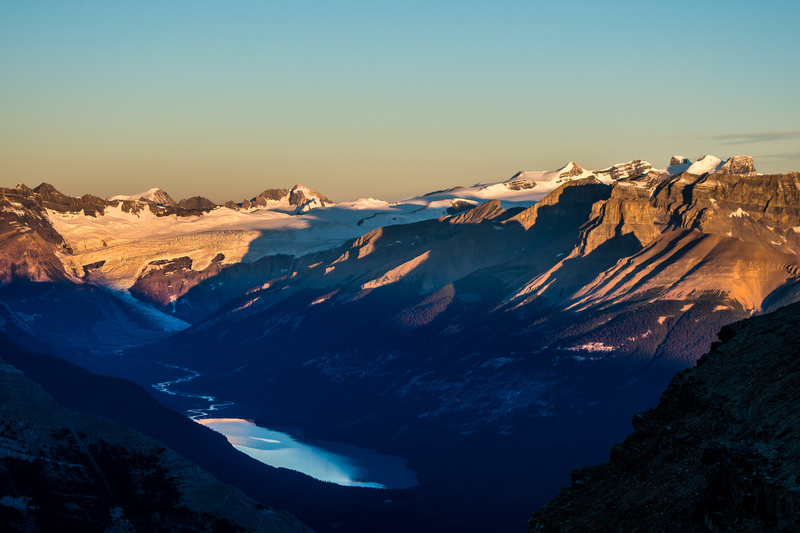 Glacier Lake and the Lyell Icefield. Kaufmann Peaks and Sarbach at left with Forbes rising over them. Mount Columbia at far distant right. 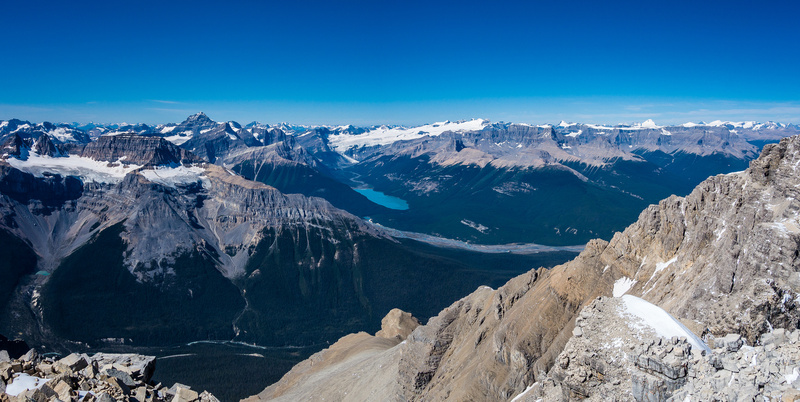 Vern on the summit of Mount Murchison. 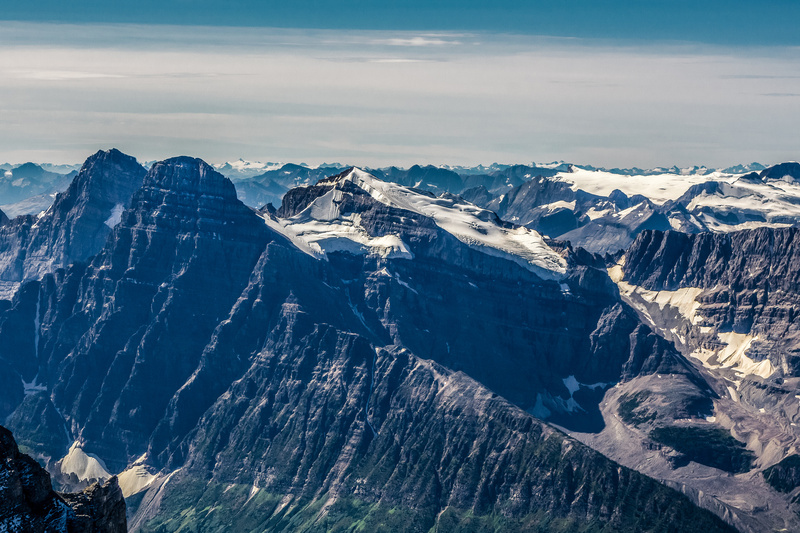 Hall Tower on the right and Marmota Peak at center with Recondite, Augusta and Harris in the far distance over Marmota. Mount Hector just left of center. Bow Peak just right of center. 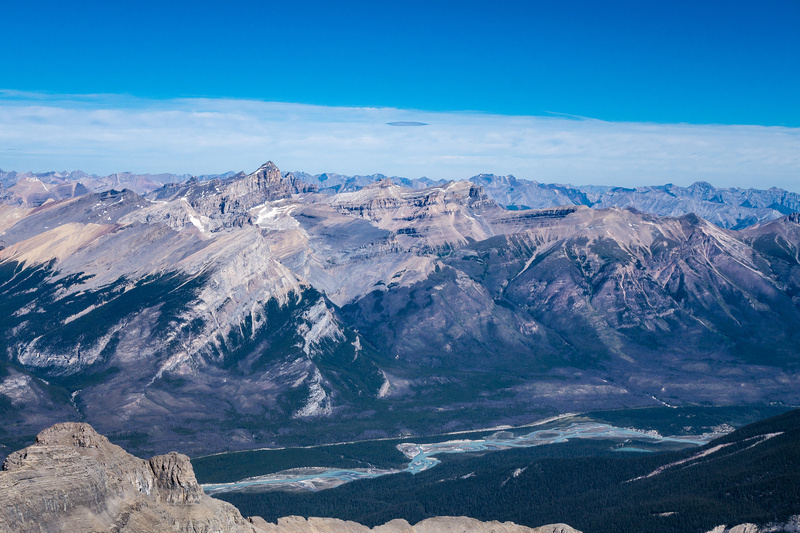 Looking toward the Wapta Icefields - even the Goodsirs are visible. Chephren (L) and White Pyramid (C). Mummery on the left and Epaulette on the lower foreground, right. Looking west over Mount Sarbach with the giant Mount Forbes rising at right. Outram in front of Forbes. 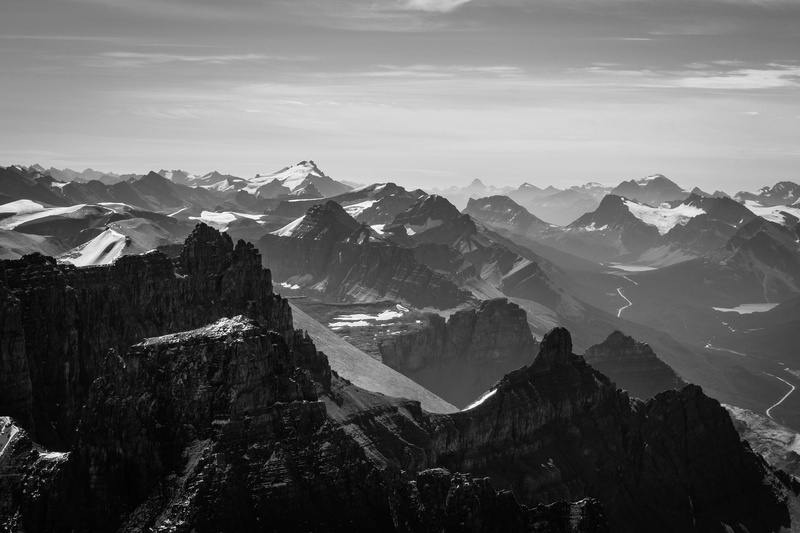 Chephren and White Pyramid on the left, Epaulette and Kauffmann peaks in the center and Sarbach and Forbes on the right. 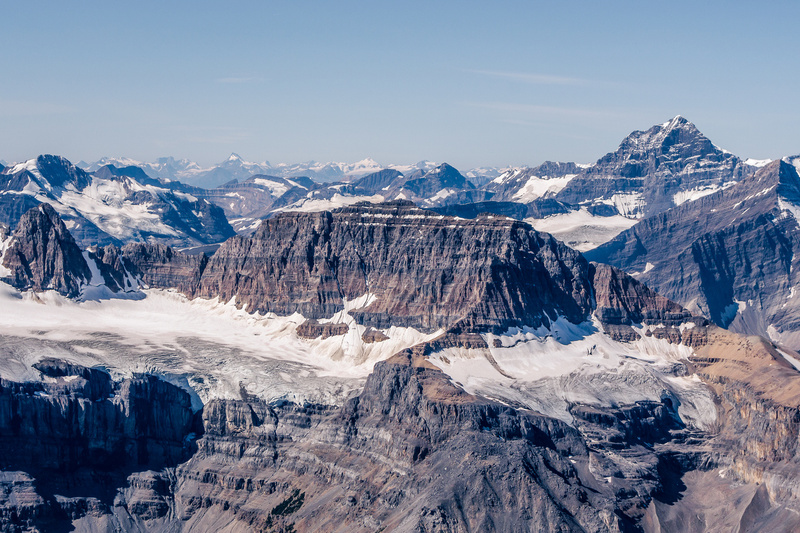 Glacier Lake with the Lyell Icefield rising to the 5 Lyell 11,000ers - Christian, Walter, Ernest, Edward and Rudolph (L to R). 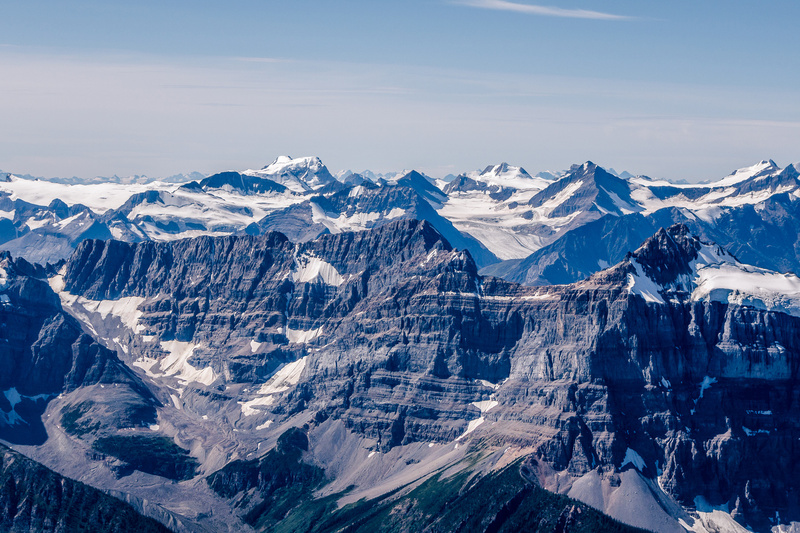 Looking over Erasmus towards Mount Clemenceau, King Edward, Columbia, Amery, South Twin, North Twin, Snow Dome and Kitchener (L to R). Mount Wilson with Cirrus in the distance. 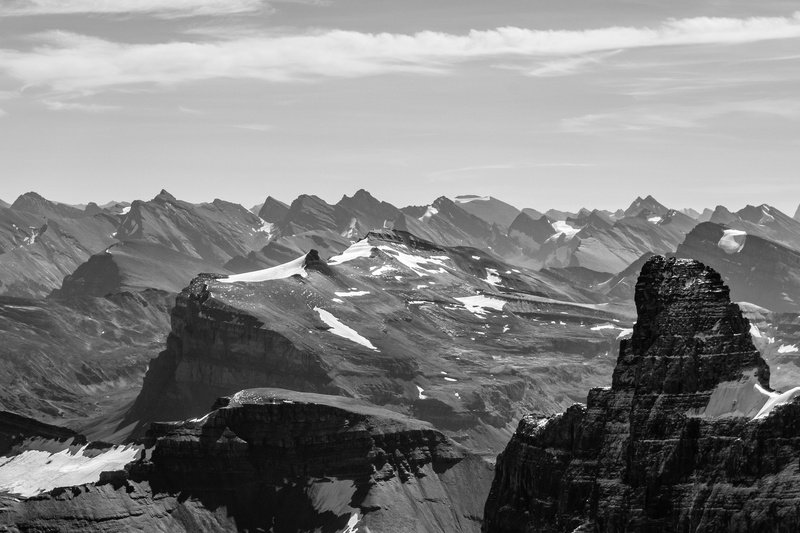 Views towards Sarbach and Glacier Lake with many large peaks on the panorama. Mount Wilson and Cirrus to the right of the NW summit of Murchison. Bryce, Clemenceau and Columbia in the distance. 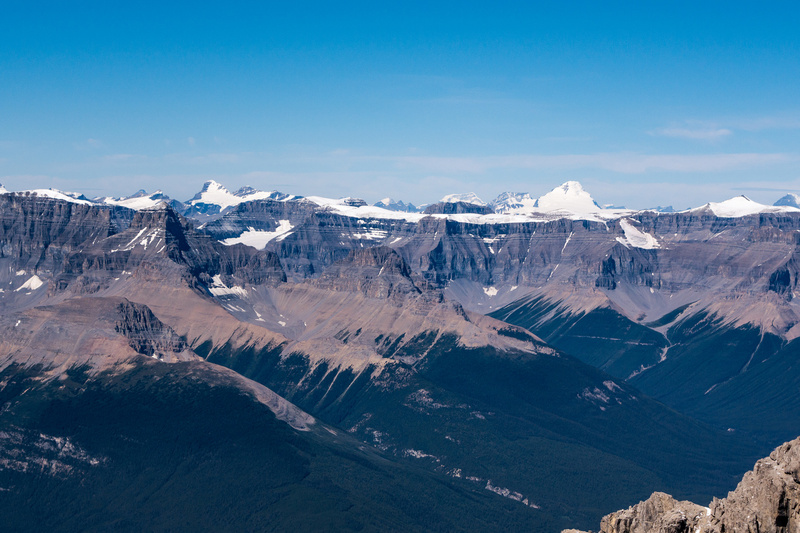 Gazing far to the southwest towards Hector, Assiniboine, Temple and Victoria in the far distance. 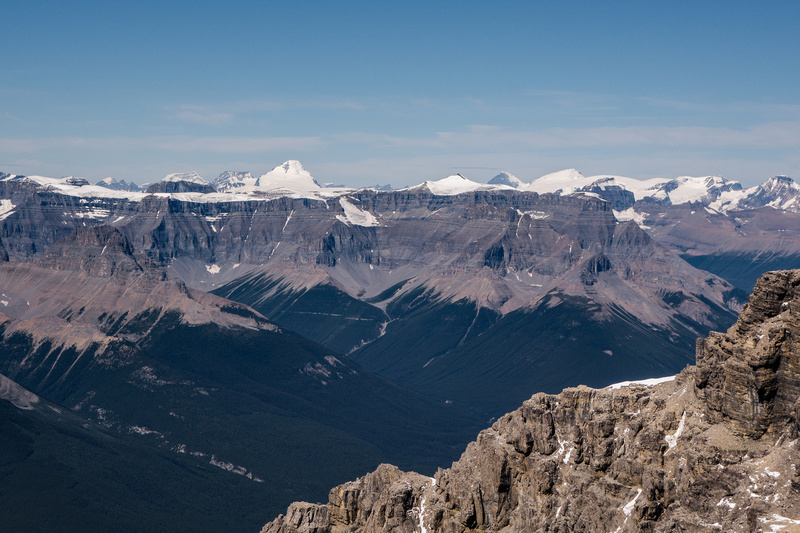 Looking over Marmota Peak towards the distant forms of Augusta, Recondite and Abstruse Peak. 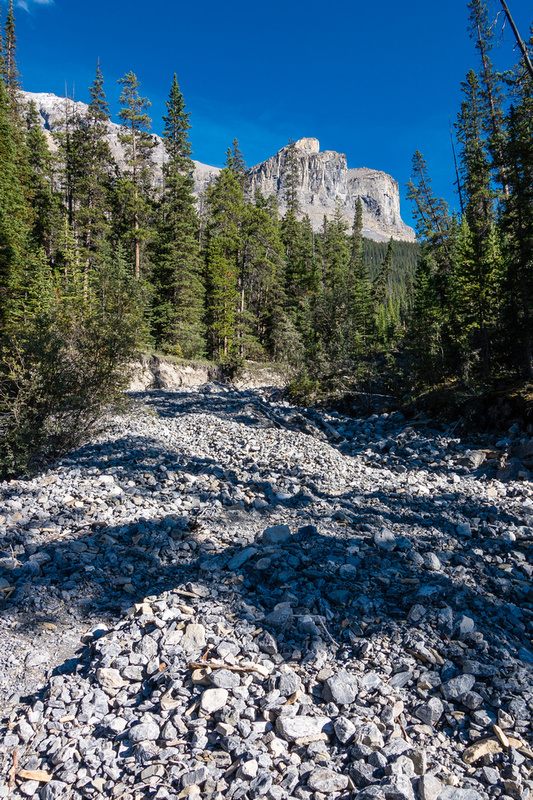 The North Saskatchewan River flows beneath Cline and Resolute. Looking down steep terrain off the summit block. Down climbing off the summit block. Traversing back to the ridge from just under the summit block. 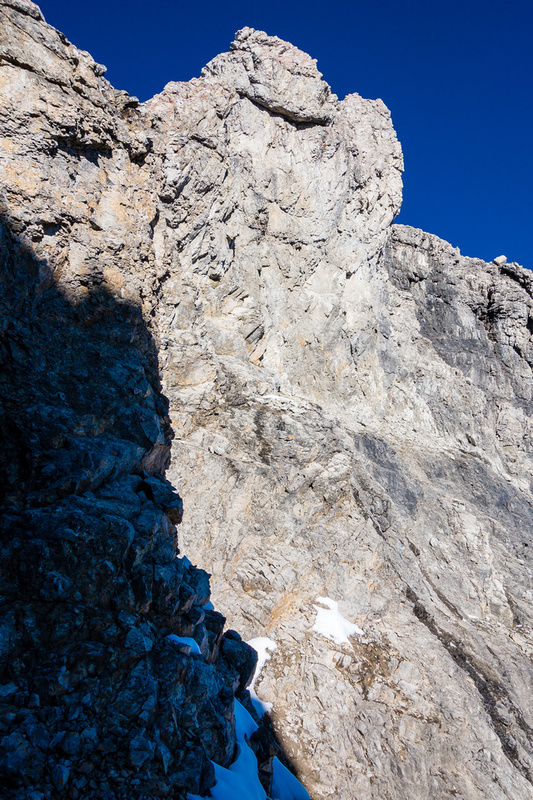 Looking back at the crux wall that we ran into. The terrain above Raf here, may have avoided our crux (which is out of sight to the right) but we're not sure. The very impressive north face of Murchison, plunging down a few thousand meters to a lush valley below. 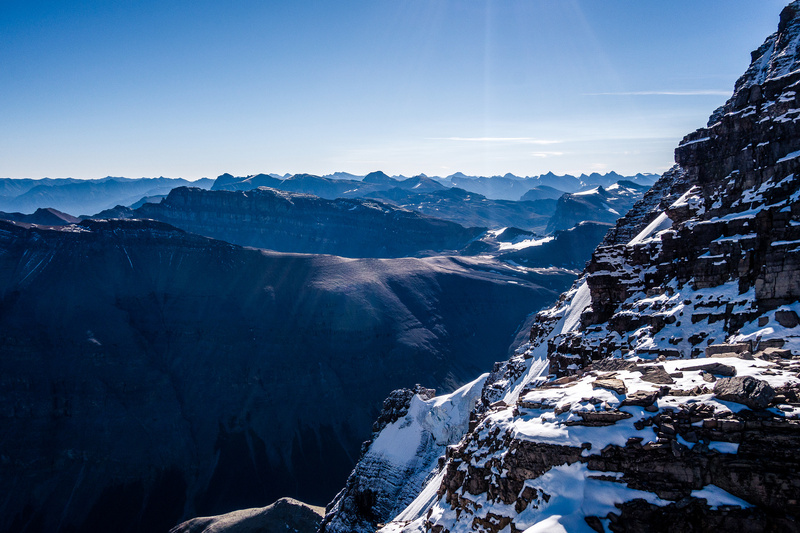 Looking over at the 3333m NW summit. 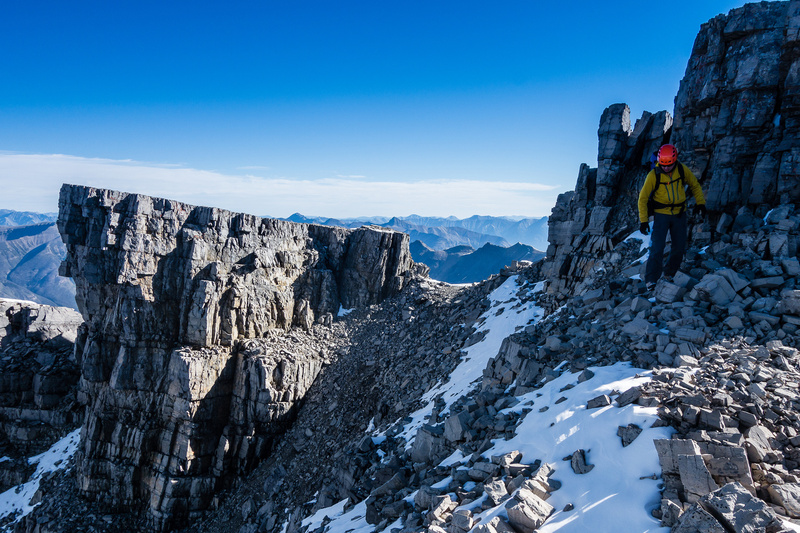 More steep terrain on the ridge with the impressive north face and summit rising behind us. Looking down our ascent gully from the col.
One of my favorite shots from the trip - coming off one of the ledge traverses under the ridge. A wee bit of exposure around this corner! Picking our way back along our steps. 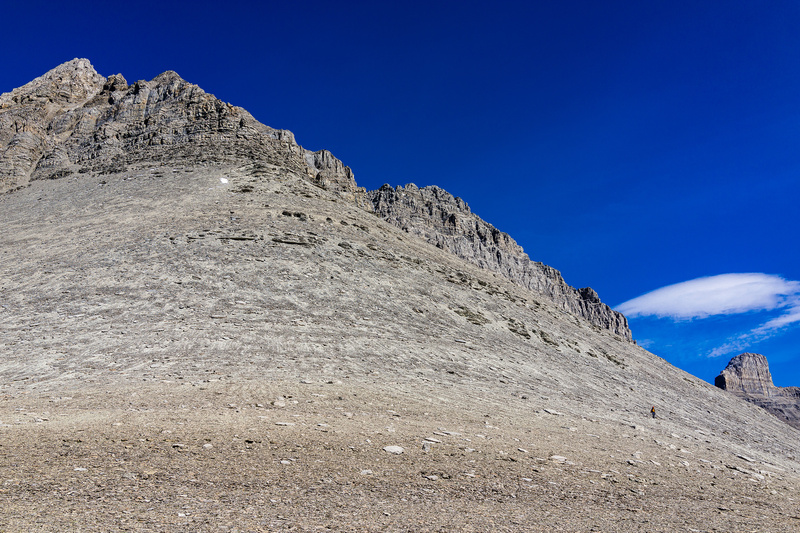 Looking back up at the distinctive pinnacle in the col. Taking a well-deserved rest at a water seep along the south slopes back to the first ascent gully. Back in the first gully under the NW summit. 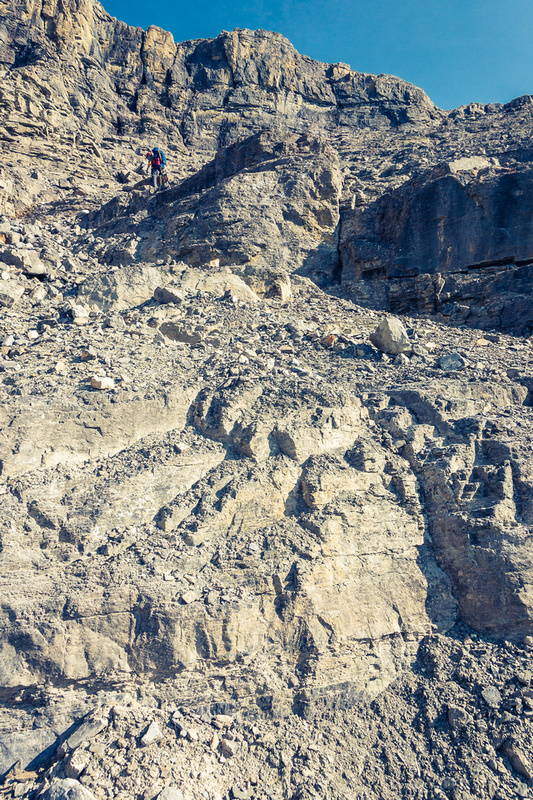 Raf is tiny in the huge terrain as we exit the south face. Gorgeous views over some alpine tarns to the towers of Murchison, including Hall Tower at far left. 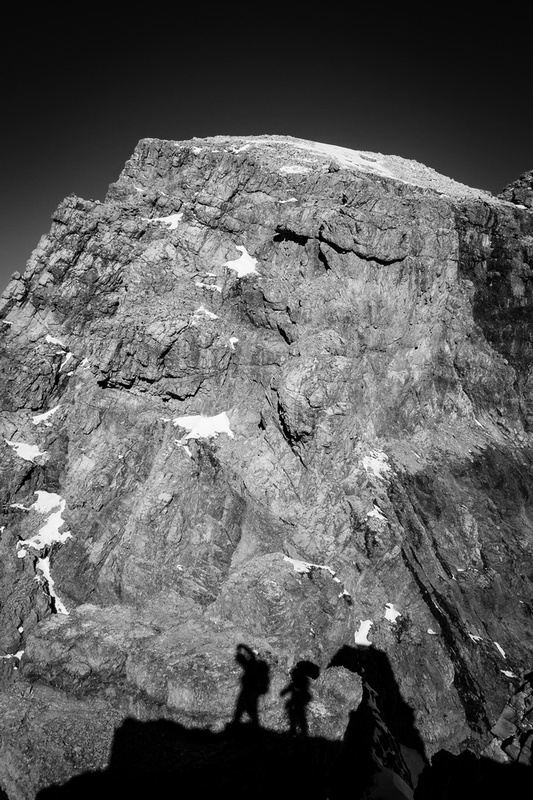 Raf looks tiny next to the huge terrain with the SW ridge rising to the NW summit at upper left. 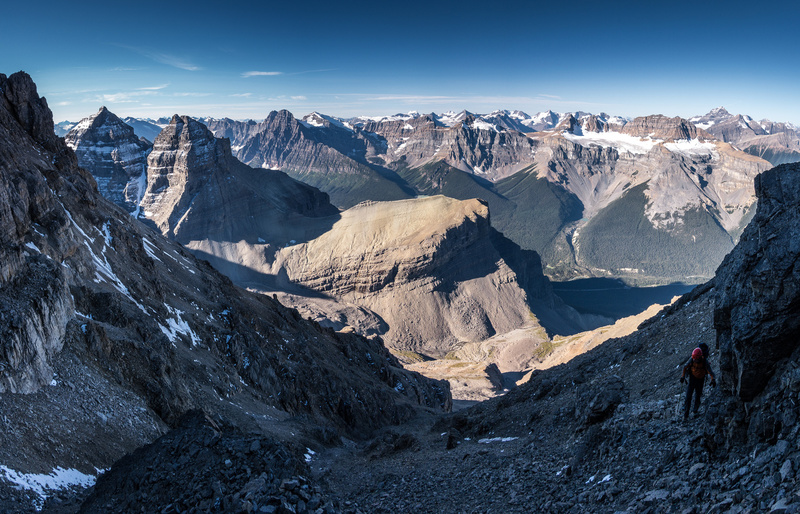 A beautiful afternoon pano of Saskatchewan Crossing and mounts Wilson and Cline. A long way to go yet!! The difficult stuff isn't quite done when you get back into the amphitheater. Lots of slabby terrain with loose rock, but at least there's refreshing, running water. Now a distant memory, looking up at the amphitheater from the creek bed near the highway.